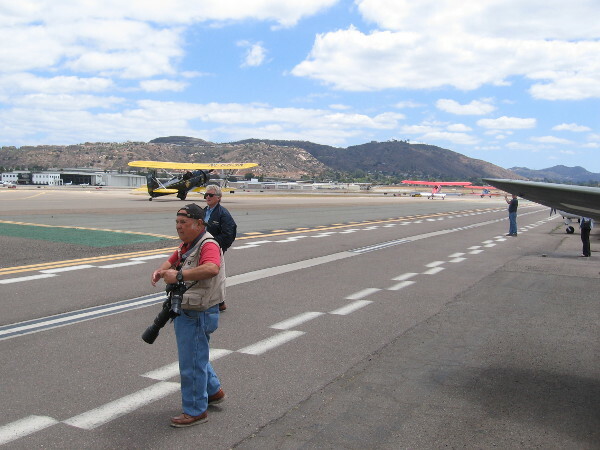 el cajon – Cool San Diego Sights! A visit to the Air and Space Museum Annex! 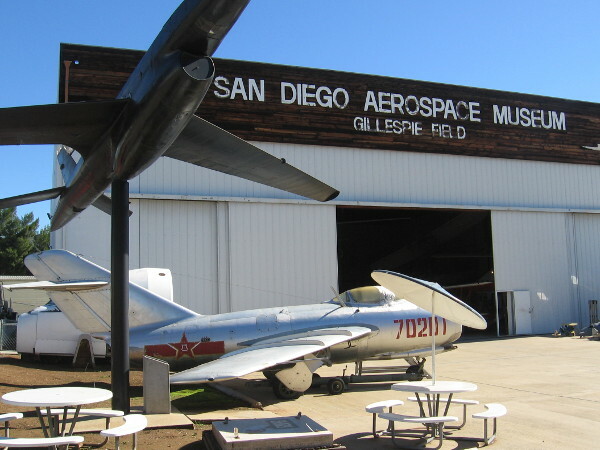 Lots of cool sights await visitors to the free San Diego Air and Space Museum’s Gillespie Field Annex! 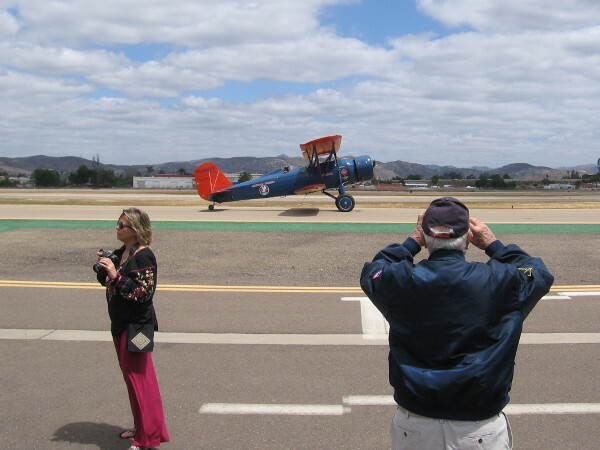 One of the coolest free attractions in San Diego is located in East County at Gillespie Field. 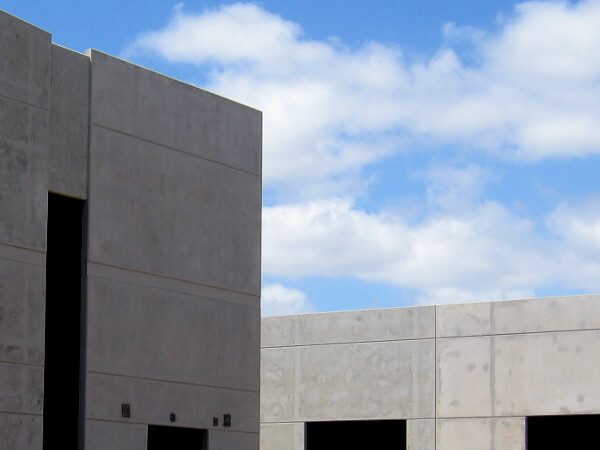 That’s where you’ll find the annex of Balboa Park’s famous Air and Space Museum! 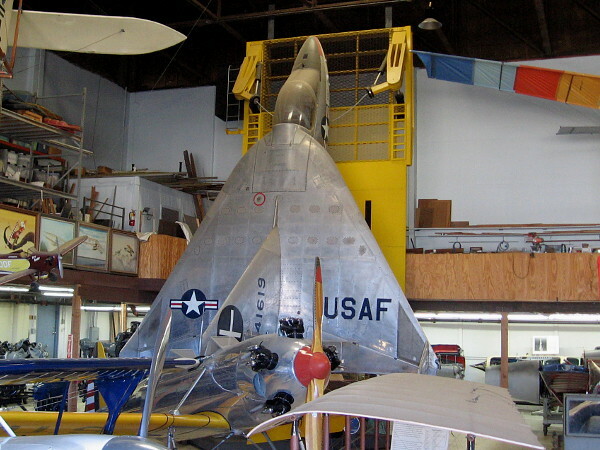 Yesterday morning I ventured east to El Cajon to visit the San Diego Air and Space Museum’s Gillespie Field Annex for the very first time. 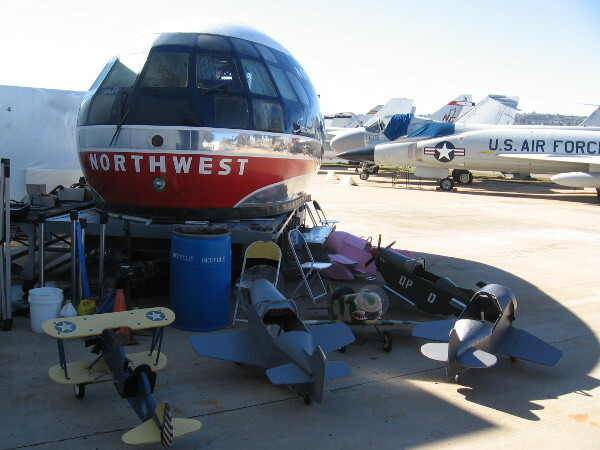 I’d read that they have a collection of old aircraft, but I really didn’t know what to expect. 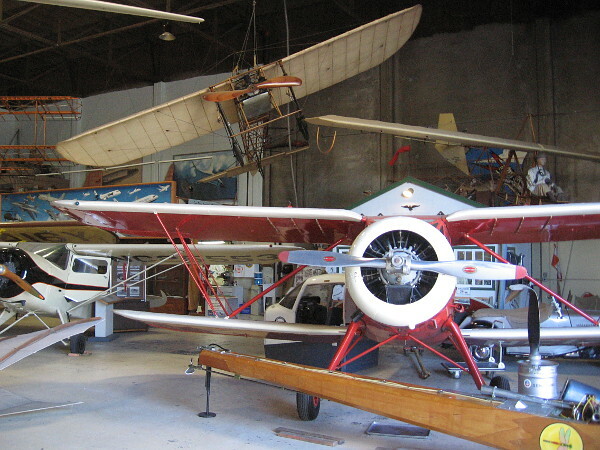 The annex is a treasure trove of restored and unrestored aircraft, plus old exhibits once housed by the museum in Balboa Park. Volunteers at the Gillespie Field Annex are happy to show families around. 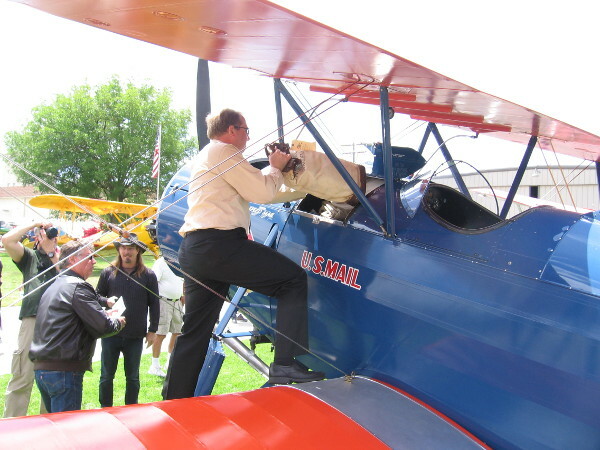 Excited kids can sit inside commercial airline cockpits, and adults can marvel at the development of aviation technology over the years. 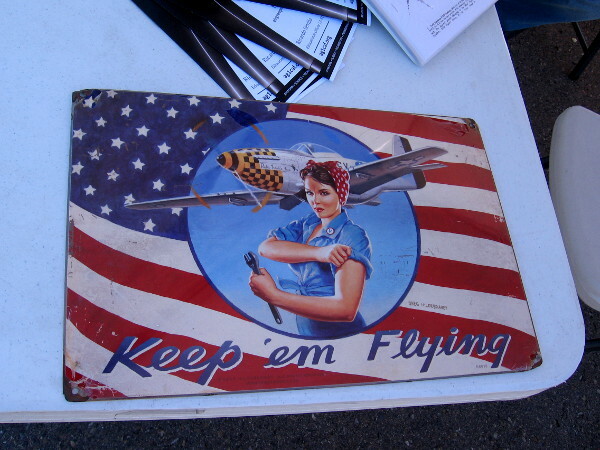 There are so many amazing displays in the hangar and outside, it’s hard to describe. 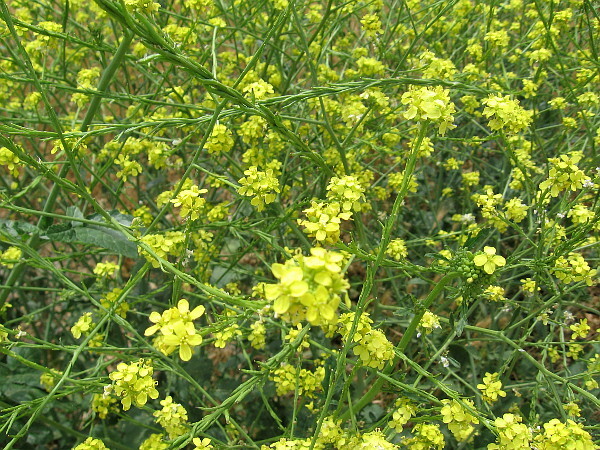 So I offer you these photos with informative captions! 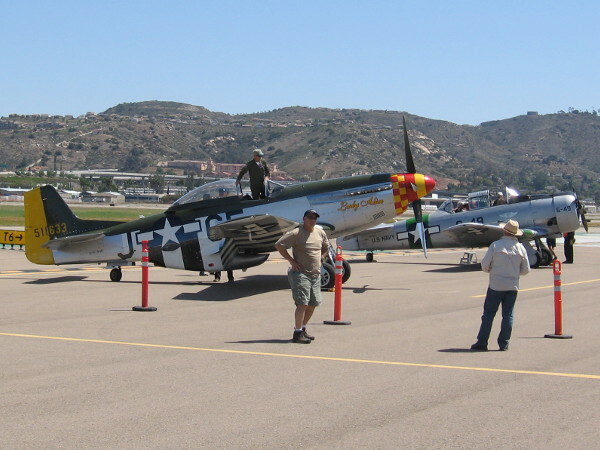 If you happen to be in San Diego, go check it out for yourself! 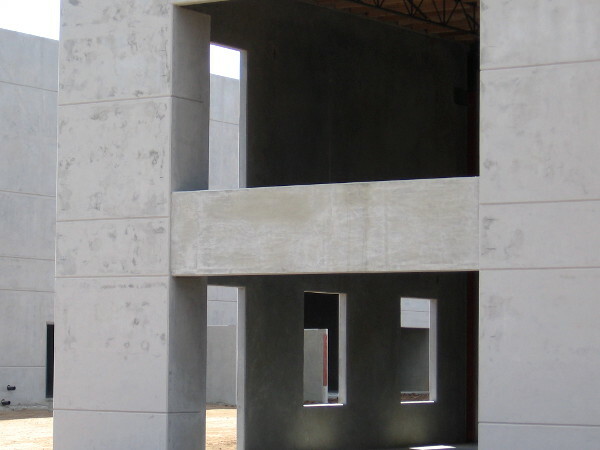 While admission to the annex is free, they’d appreciate a few bucks in their donation box! 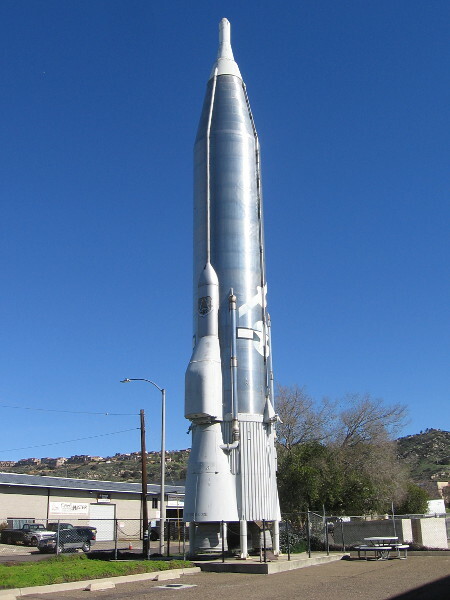 An imposing Atlas missile stands in one corner of the annex’s parking lot! 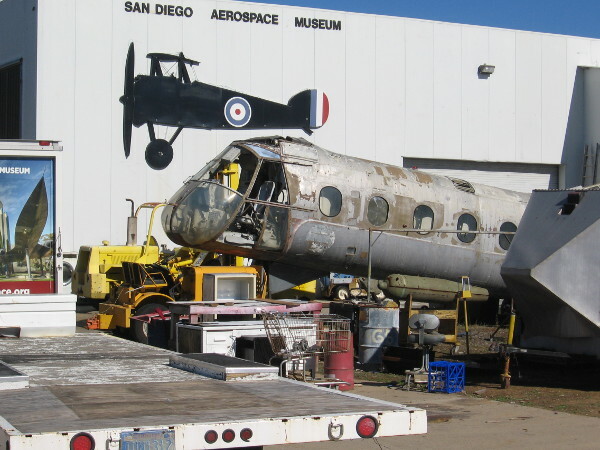 Cockpit exhibits and aircraft in various stages of restoration stand outside the museum annex hangar. Inside the hangar there’s a ton of cool stuff, including many old exhibits from the main San Diego Air and Space Museum in Balboa Park. 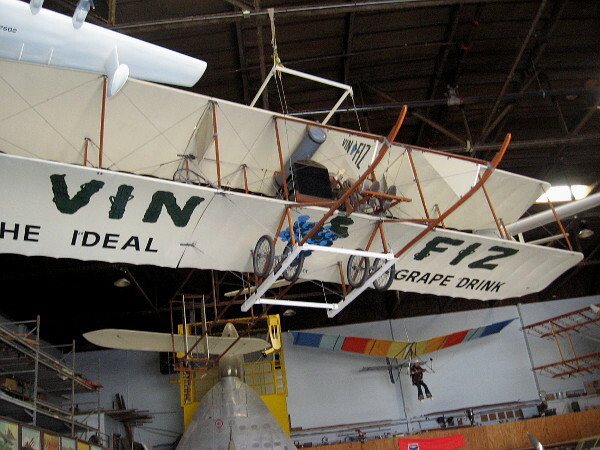 Replica of the Smithsonian’s original Vin Fiz Flyer dangles from the ceiling. 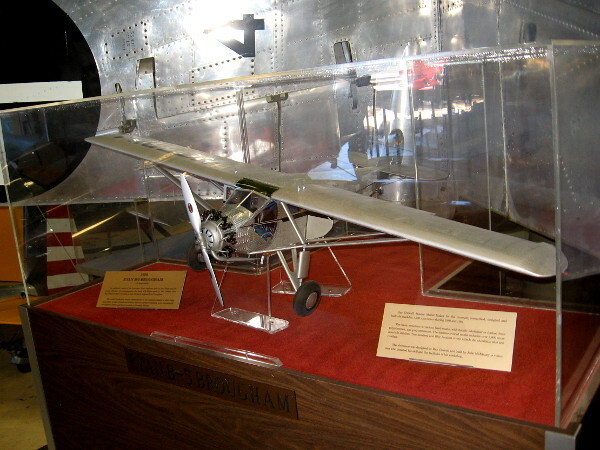 This one-of-a-kind Wright Brothers airplane was the first aircraft to fly coast-to-coast. The journey took almost three months! 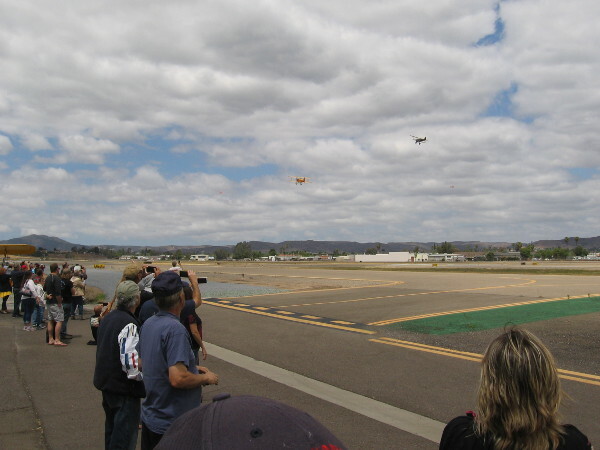 Ryan X-13 experimental vertical take-off and landing (VTOL) jet created by the Ryan Aeronautical Company of San Diego. 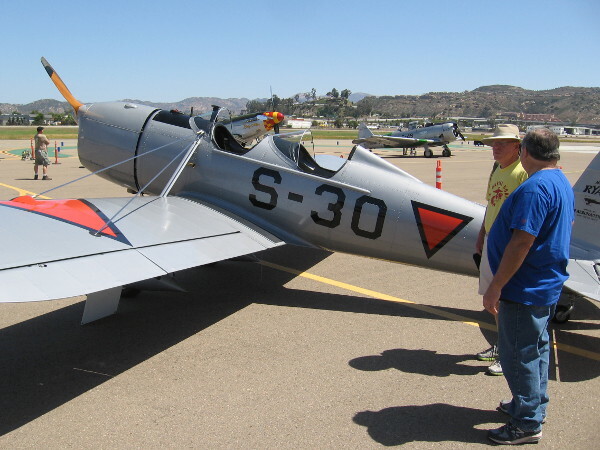 This particular aircraft was test flown in 1955 at Edwards Air Force Base. 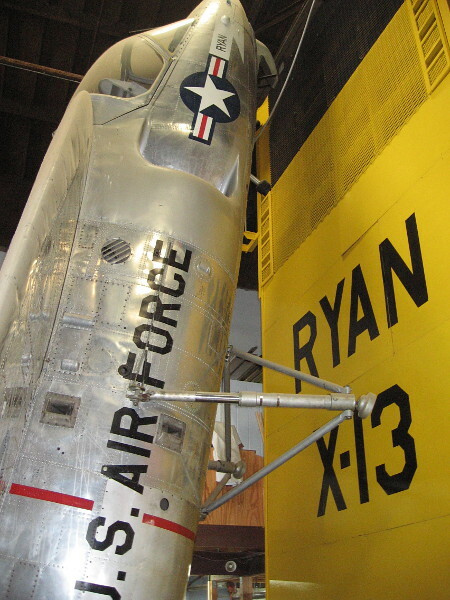 Looking past the Ryan X-13 Vertijet at other exhibits in the annex hangar, including a yellow Ryan Recruit military trainer. 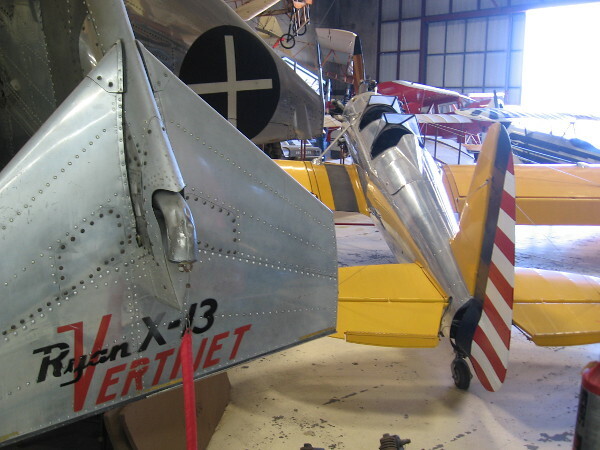 This particular Ryan X-13 was the result of a contract with the U.S. Air Force, as you can see by the markings. 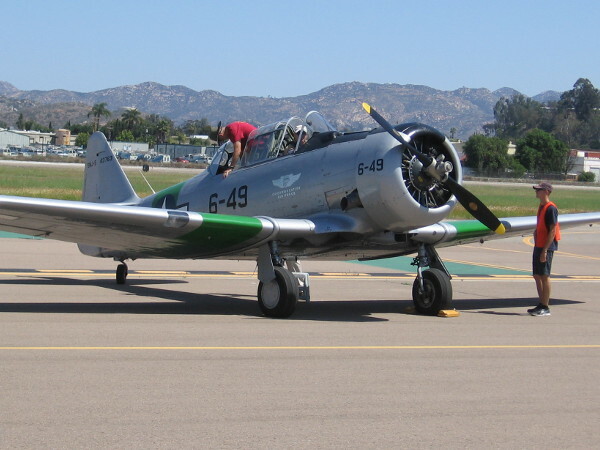 Ryan ST-3KR (PT-22) Recruit, an aircraft used to train thousands of pilots during World War II. 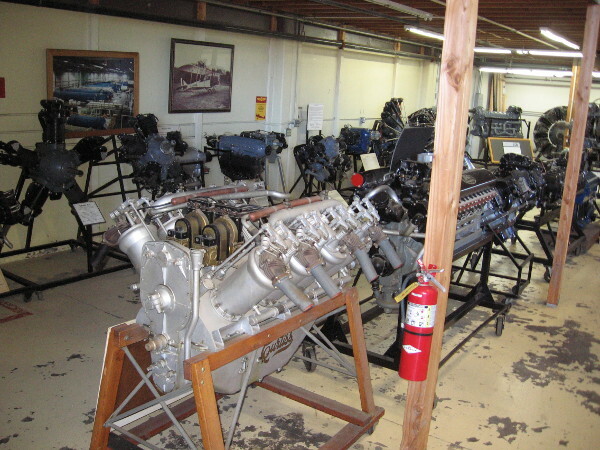 Numerous aircraft engines on display at the San Diego Air and Space Museum’s Gillespie Field Annex. 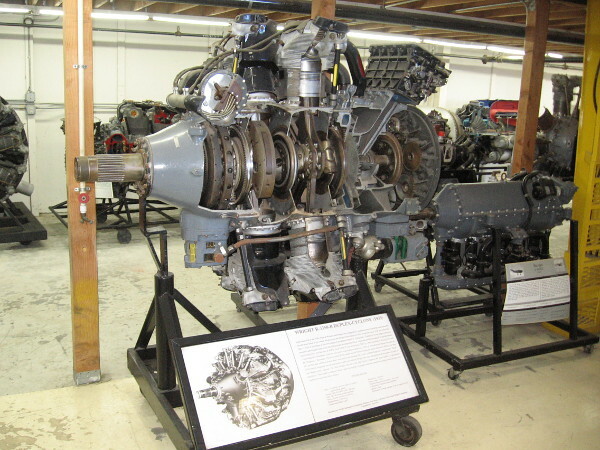 Wright R-3350-B Duplex-Cyclone 1939 aircraft power plant, at the time the most powerful radial engine in the world at 2000 HP. 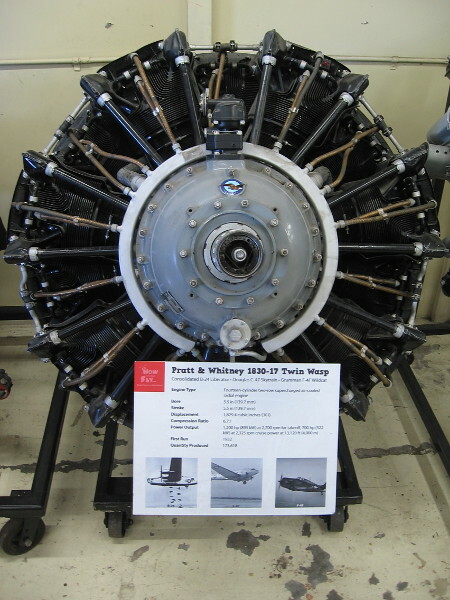 Pratt and Whitney 1830-17 Twin Wasp, used in several World War II aircraft. 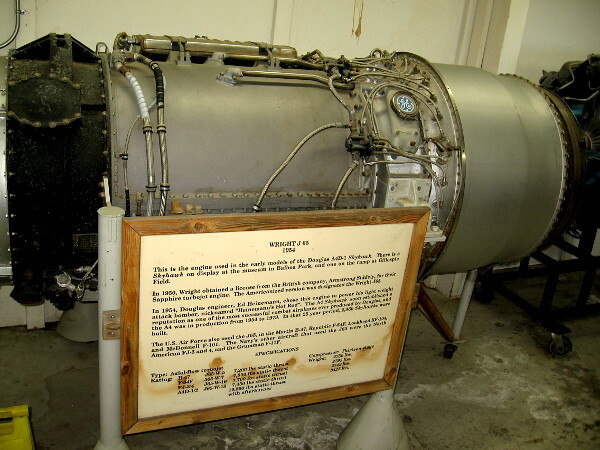 Wright J65 turbojet engine, 1954. 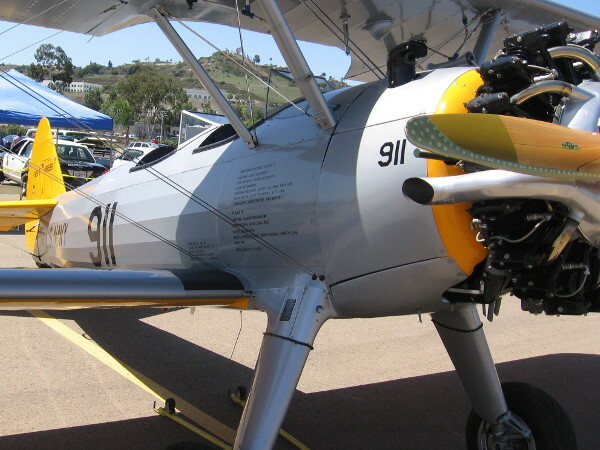 This engine powered many military aircraft in the mid 20th century, including the very successful A-4 Skyhawk. 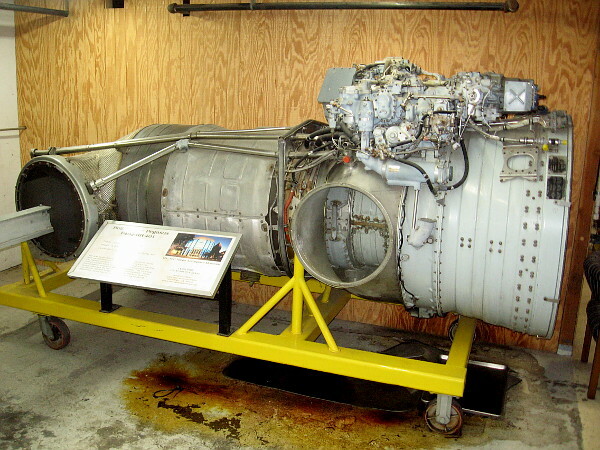 Marquardt RJ43-MA-9 ramjet engine used on Boeing CIM-10 Bomarc interceptor missiles during the 1960s. 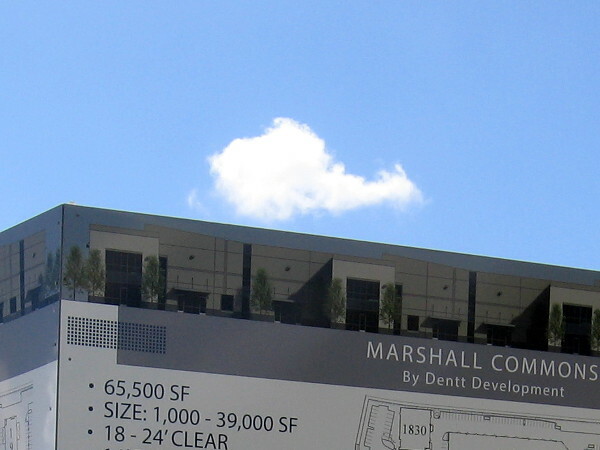 The ramjet produced speeds up to Mach 2.7, or about 1780 miles per hour. Rolls Royce Pegasus F402-RR-401 vectoring turbofan that powers the AV-8A Harrier short take-off and vertical landing aircraft. 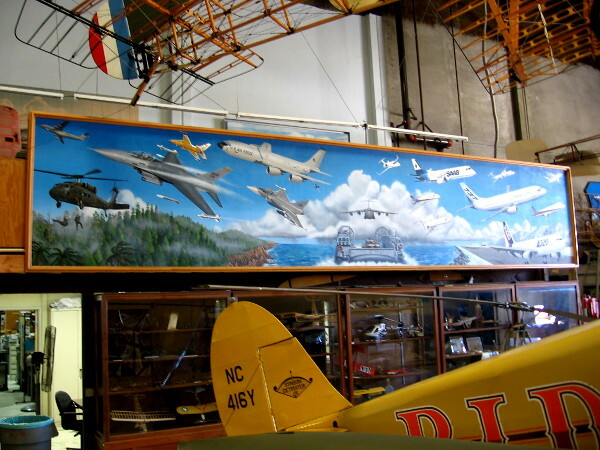 A long mural in the annex’s hangar shows a variety of modern aircraft. 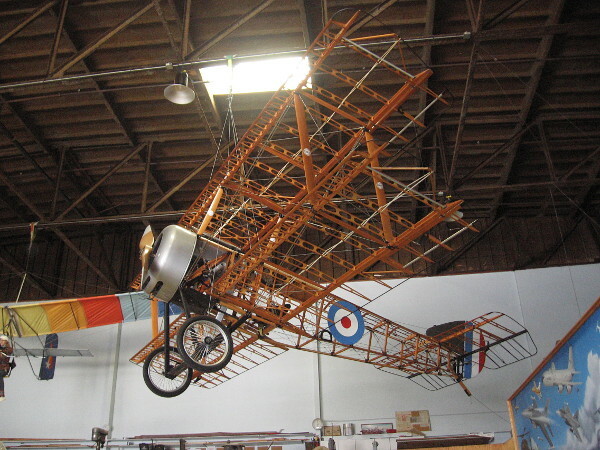 Bleriot XI dangles from the ceiling. 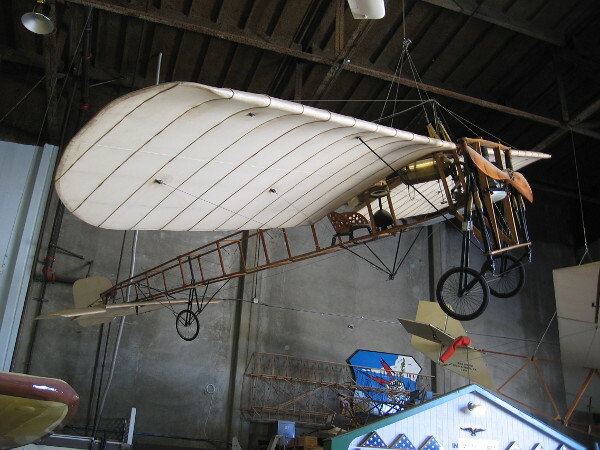 The revolutionary 1908 aircraft had a new Anzani engine that could run for one whole hour, allowing it to fly across the English Channel. 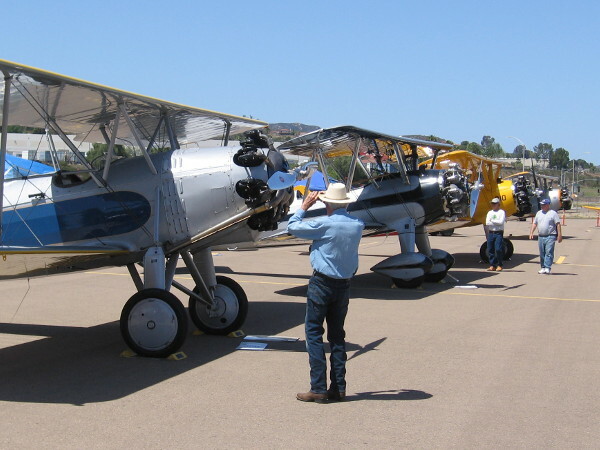 Sopwith Pup Craftsmen of the San Diego Aerospace Museum, a volunteer aircraft building project back in 2000-2003. 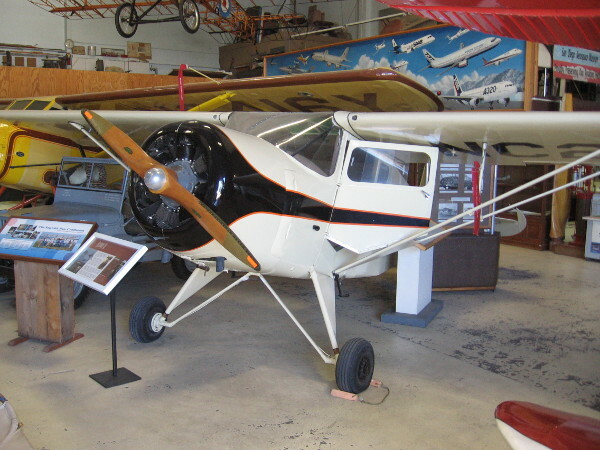 Rearwin Cloudster 8135, once displayed on the museum floor in Balboa Park. One more look inside the hangar before I head outside to see lots more cool stuff. 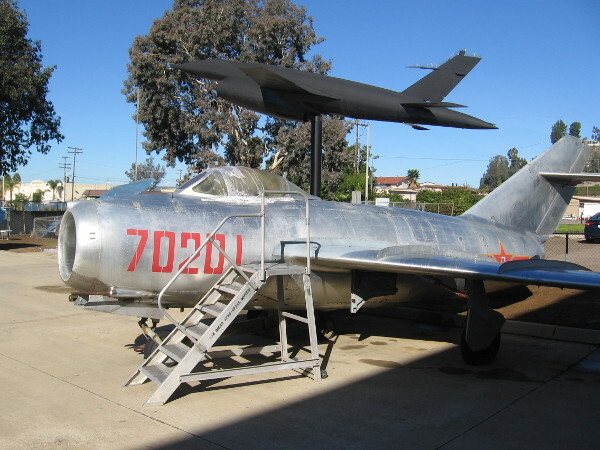 The aircraft in the foreground is a Mikoyan-Gurevich MiG-15. 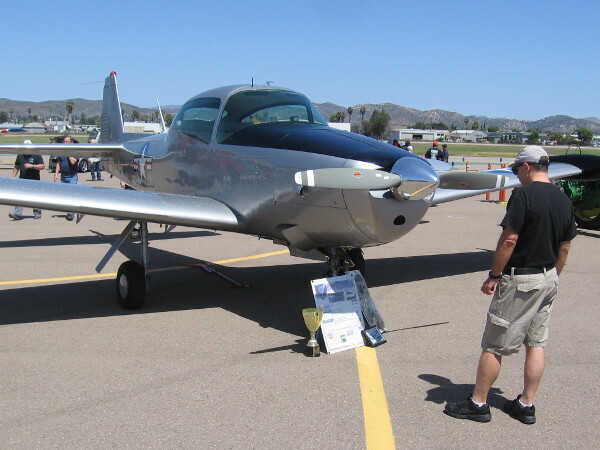 Mounted beyond it is a Ryan Model 147 Lightning Bug jet-powered reconnaissance drone. 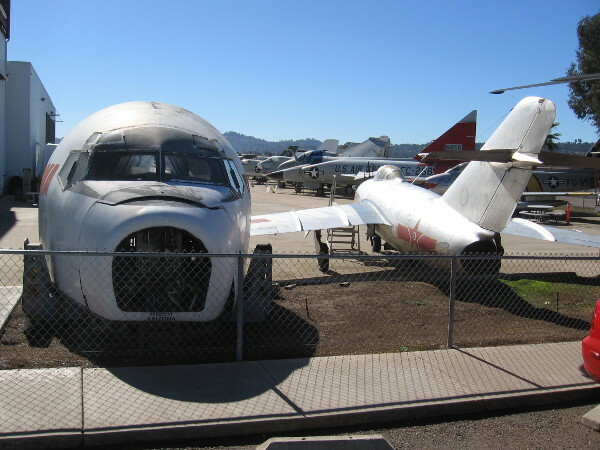 Outside the hangar doors is the nose of an old Northwest Stratocruiser that once flew to Honolulu. 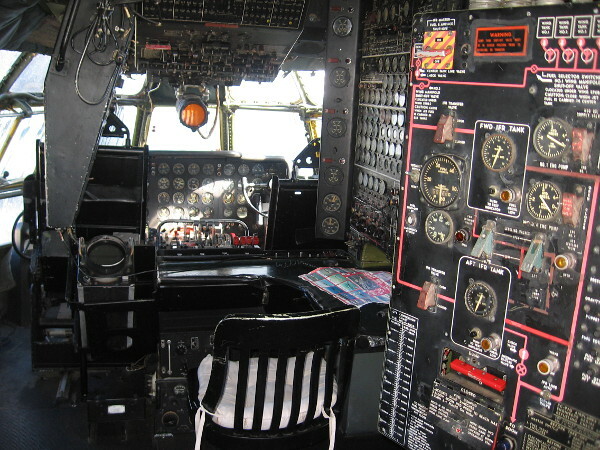 Hundreds of switches, dials and gauges inside the amazing cockpit of a Boeing 377 Stratocruiser. One can sit in the pilot’s seat and pretend to fly across the Pacific Ocean! 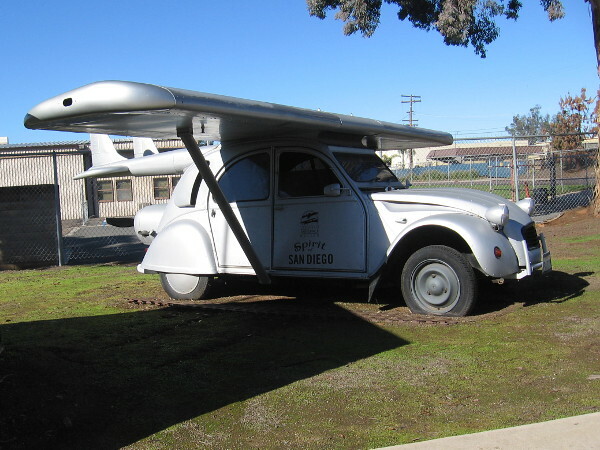 Someone created this silly flying car named the Spirit of San Diego! 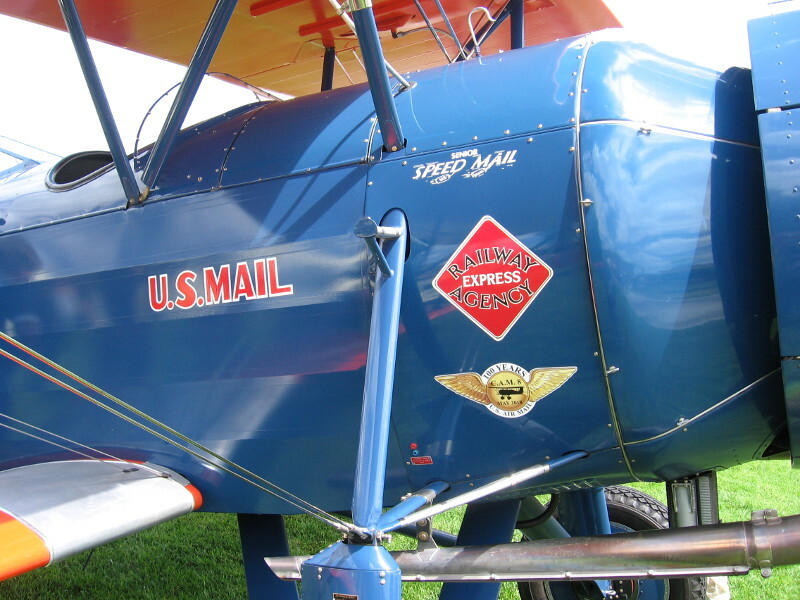 I kind of doubt they ever got this contraption off the ground. 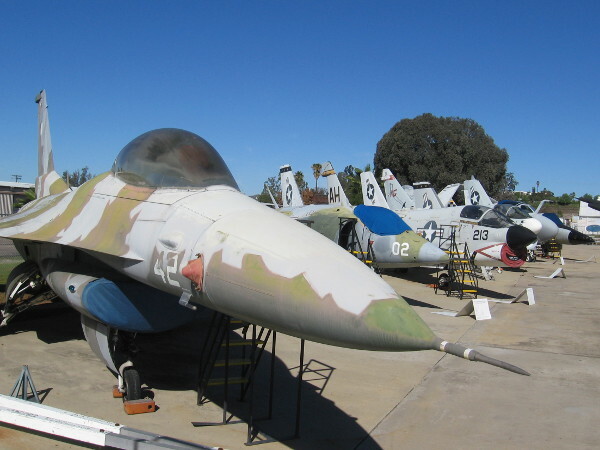 Looking beyond a General Dynamics F-16N at a line of military aircraft displayed outside. 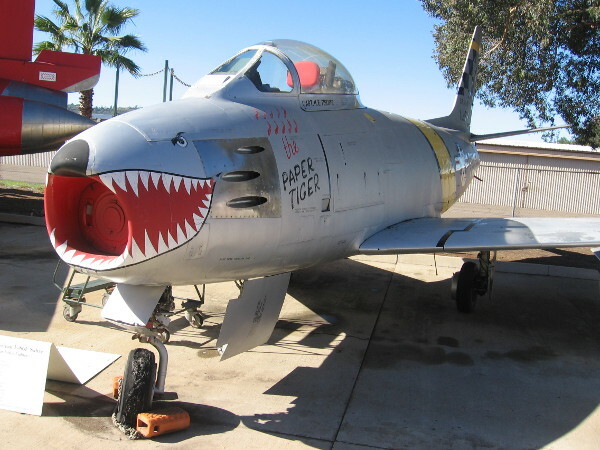 North American F-86F Sabre from the Korean War period. 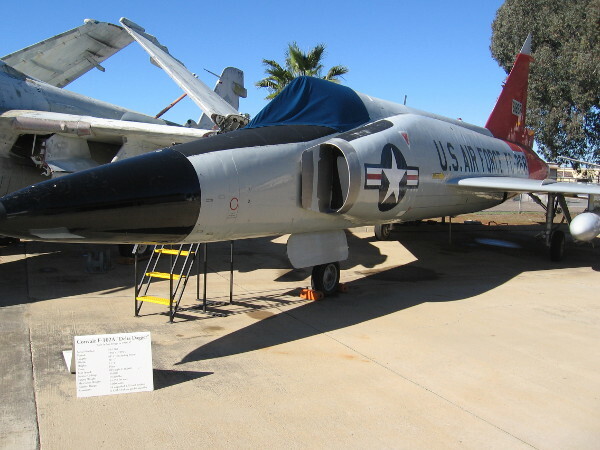 Convair F-102A Delta Dagger built in San Diego 1956-1957. 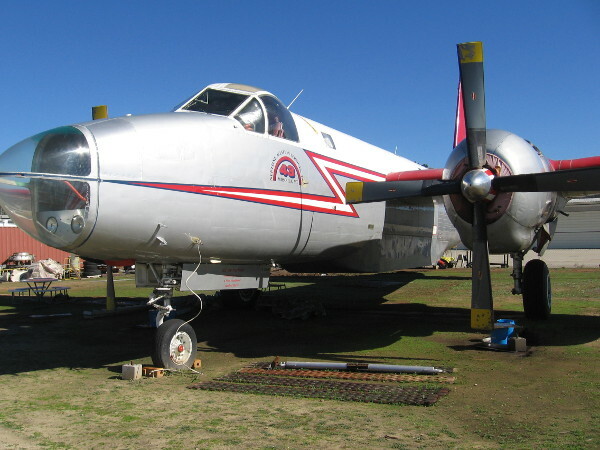 An old Neptune Aviation Services P2V-7 aerial firefighting plane–Tanker 43. 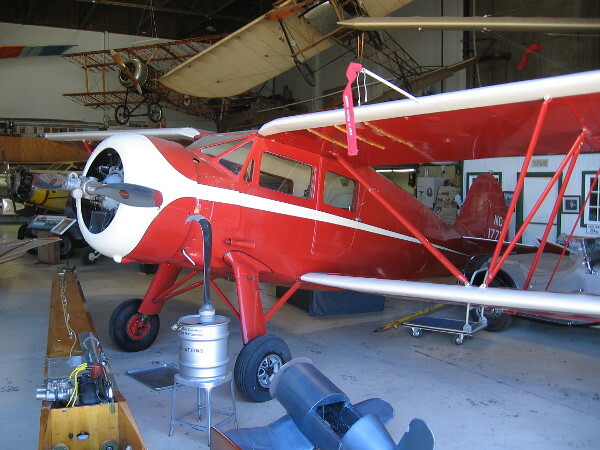 I learned there are several restoration projects now underway at the museum annex at Gillespie Field. I believe this is an old Piasecki H-21 helicopter. 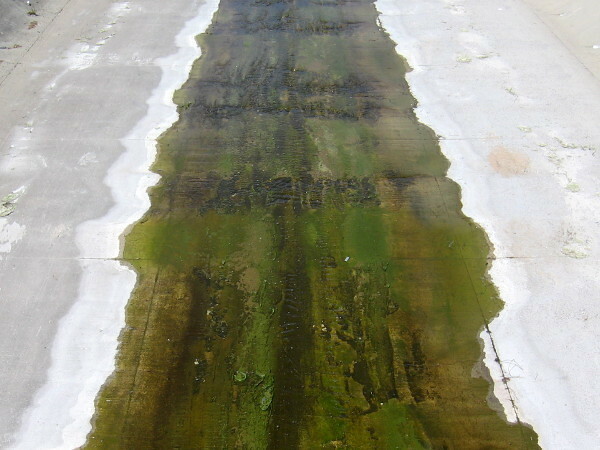 Looks like it needs some work. 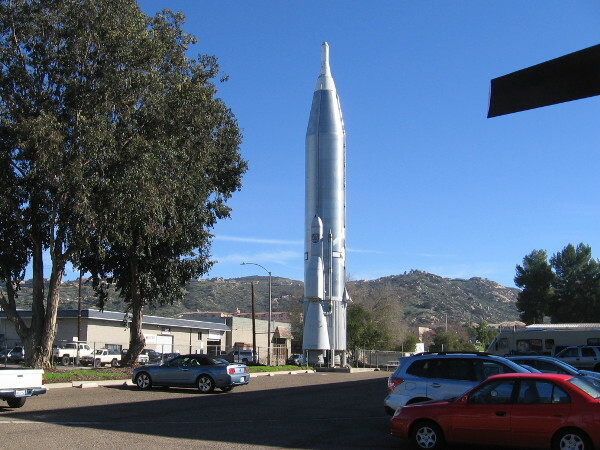 Next to the San Diego Air and Space Museum’s Gillespie Field Annex parking lot stands a tall Atlas Missile 2-E! 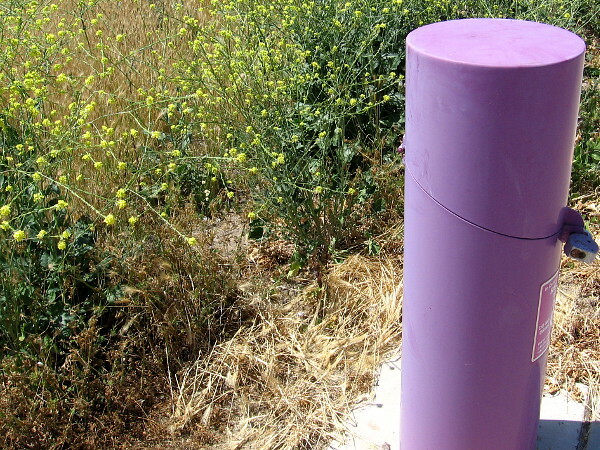 This missile was used for a static firing at Sycamore Canyon Test Facility east of MCAS Miramar. 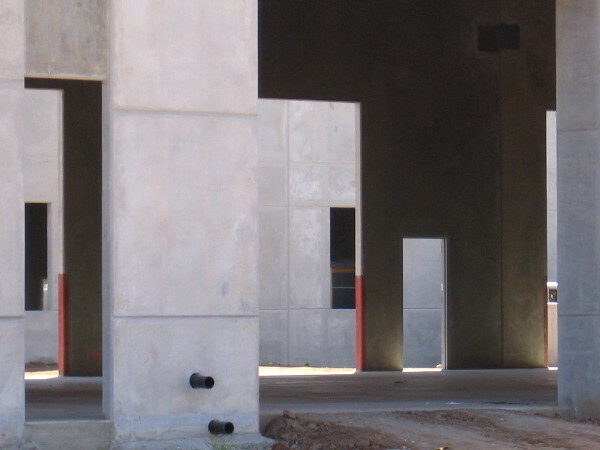 It used to stand at the entrance to Missile Park, beside the old General Dynamics complex in Kearny Mesa. 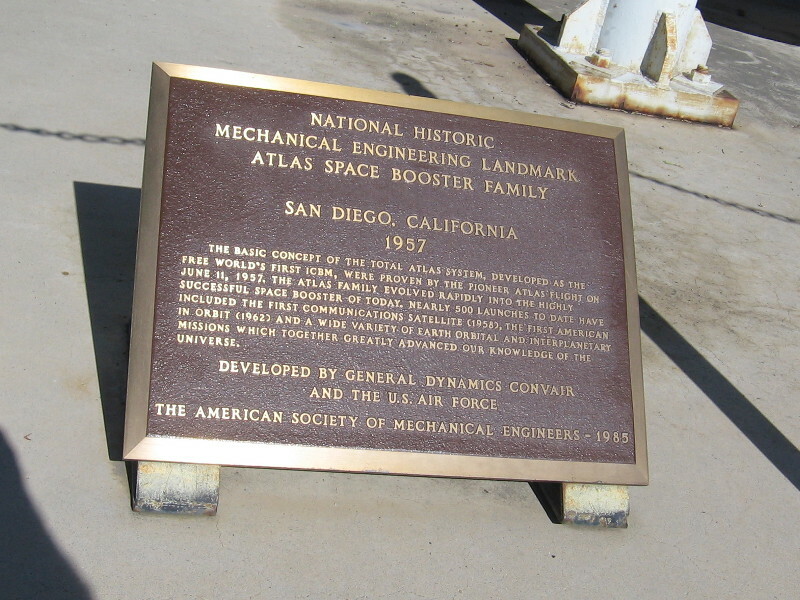 National Historic Mechanical Engineering Landmark Atlas Space Booster Family – San Diego, California – 1957. 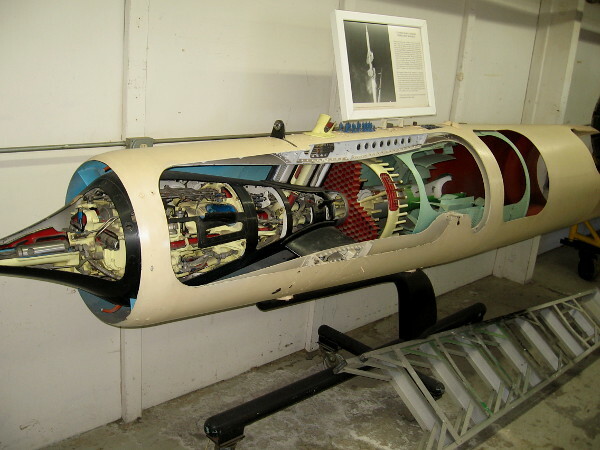 Developed by General Dynamics Convair and the U.S. Air Force. 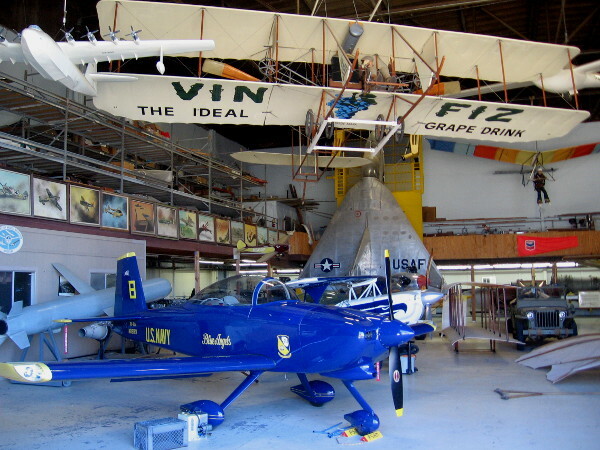 Visit the free San Diego Air and Space Museum’s Gillespie Field Annex and you’ll learn a whole lot about aviation history! 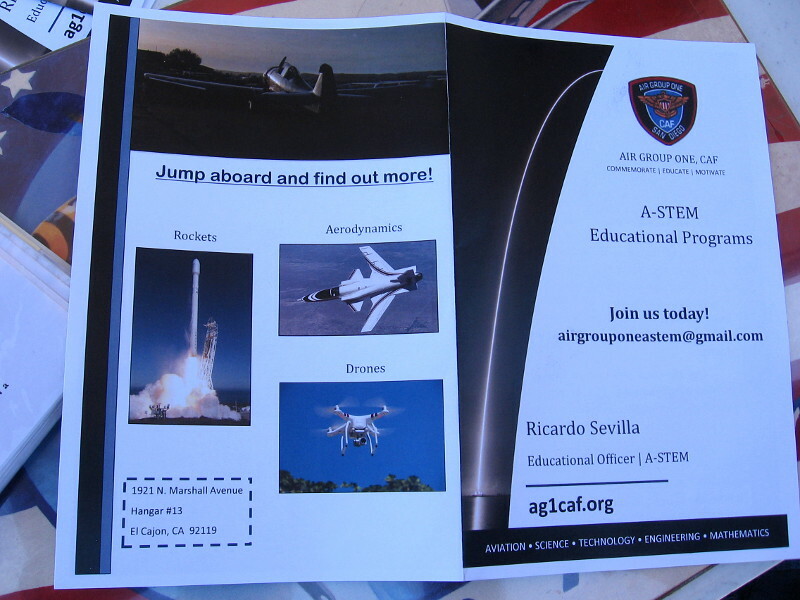 Posted on January 20, 2019 January 22, 2019 Tags airplanes, aviation, cool, el cajon, family, free, history, military, museums, san diego, southern california, technology, tourism, travel1 Comment on A visit to the Air and Space Museum Annex! 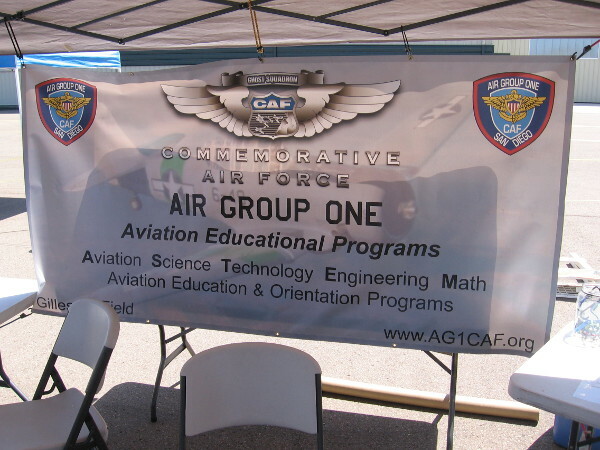 Photos of cool aviation event at Gillespie Field! 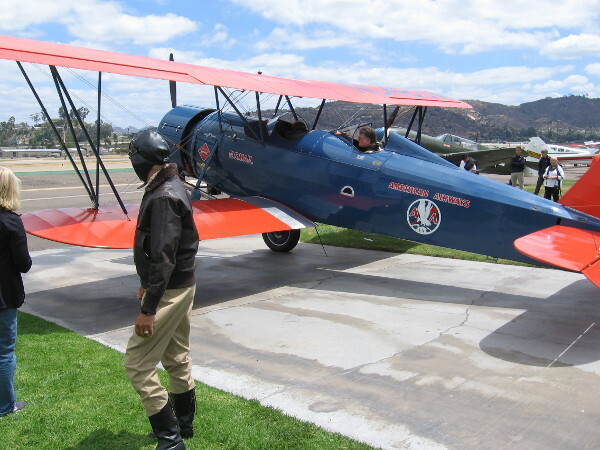 Someone looks at a restored North American L-17 airplane on display at Gillespie Field during a special Air Group One event. 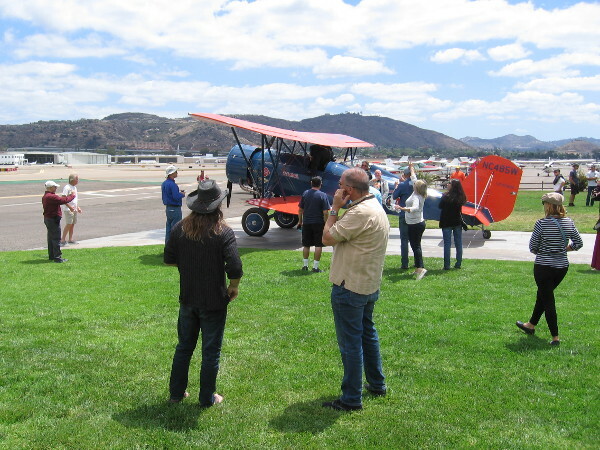 Yesterday I enjoyed a very cool event at Gillespie Field in El Cajon. 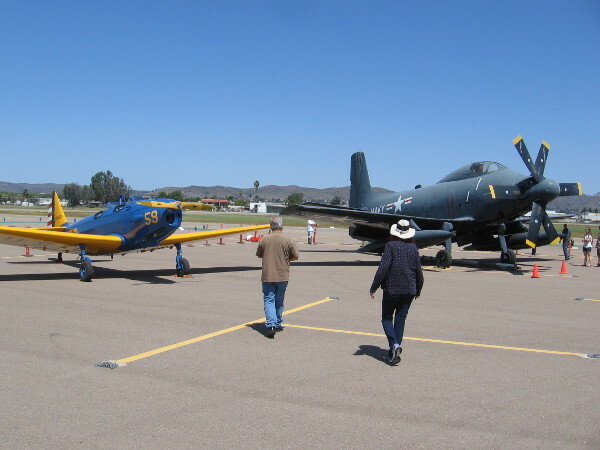 Air Group One, the San Diego wing of the Commemorative Air Force, put on a unique Warbird Expo and Aviation & Military Memorabilia Swap Meet out on the airfield’s tarmac! 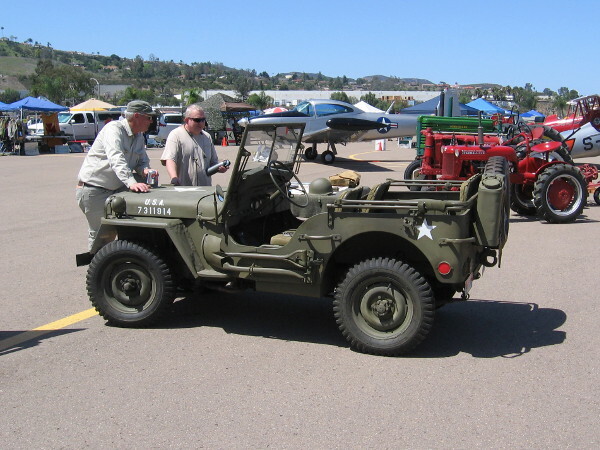 All sorts of restored World War II aircraft were on display, as well as jeeps, vintage automobiles and other unique vehicles–even old tractors! 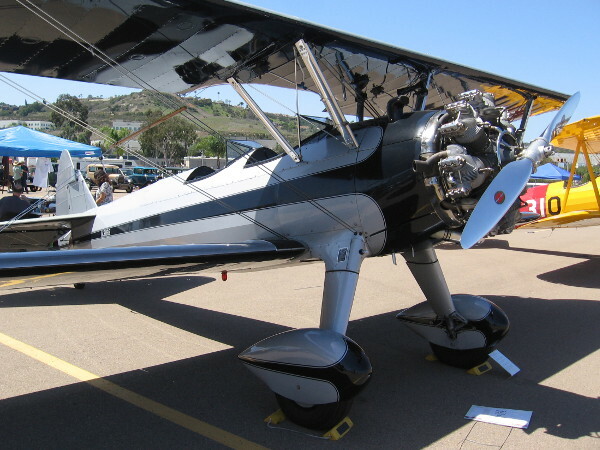 I noticed that a few of the historical airplanes belong to Air Group One; others are stationed at Gillespie Field or flew in for the occasion. 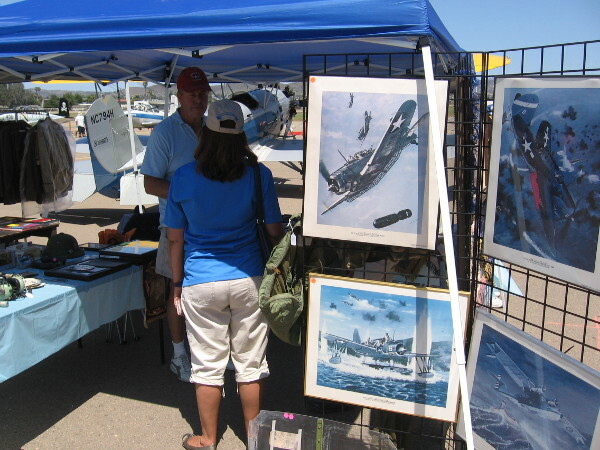 The swap meet portion of the event featured all sort of artwork and aviation collectibles. 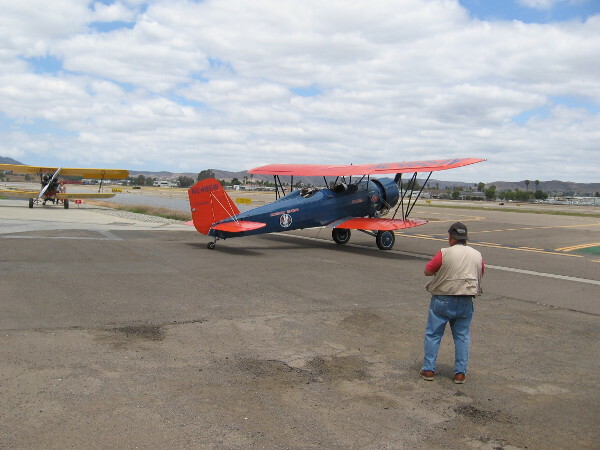 Occasionally a World War II airplane would take off, land or roar by. 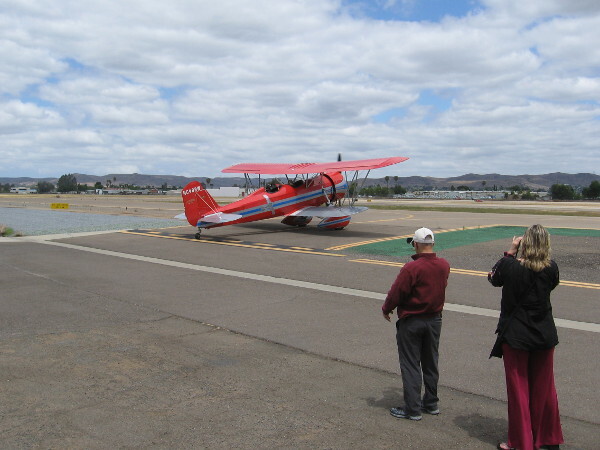 Visitors could purchase a short ride around Gillespie Field! 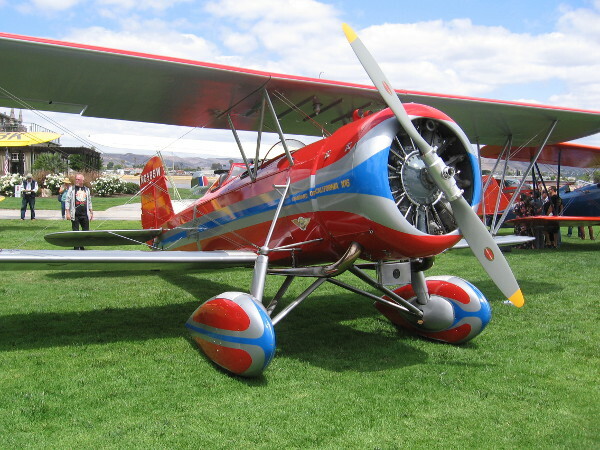 While Air Group One often participates in airshows, I was told this was their first ever event of this type. Hopefully it becomes an annual tradition! 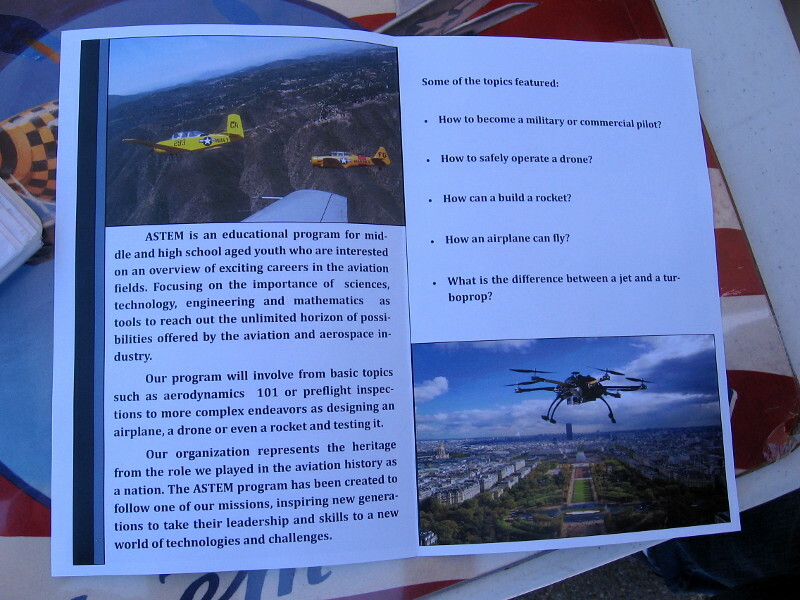 Read the photo captions to learn more! 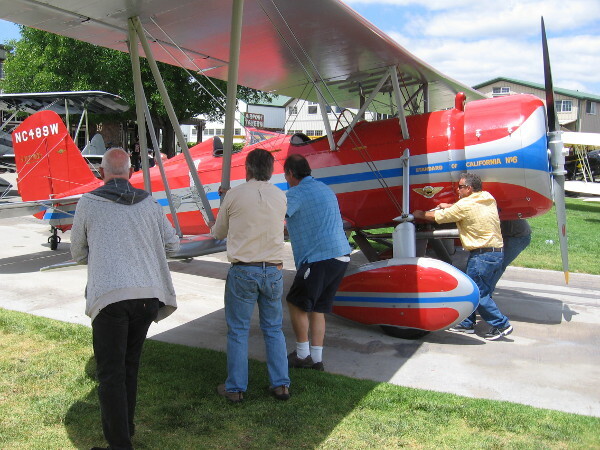 Checking out a row of shiny restored aircraft from the World War II era. 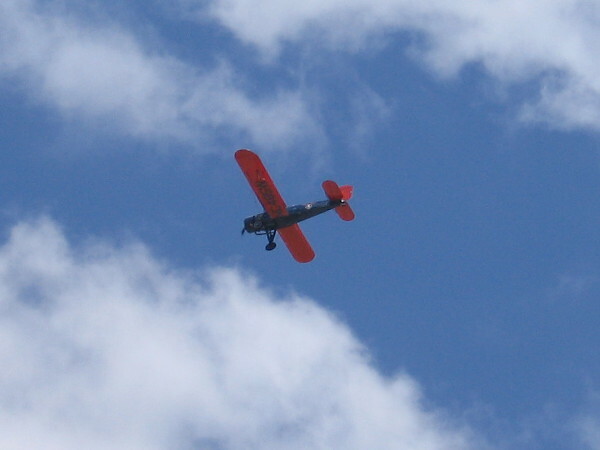 People were riding vintage military planes that helped the Allies to win World War II. 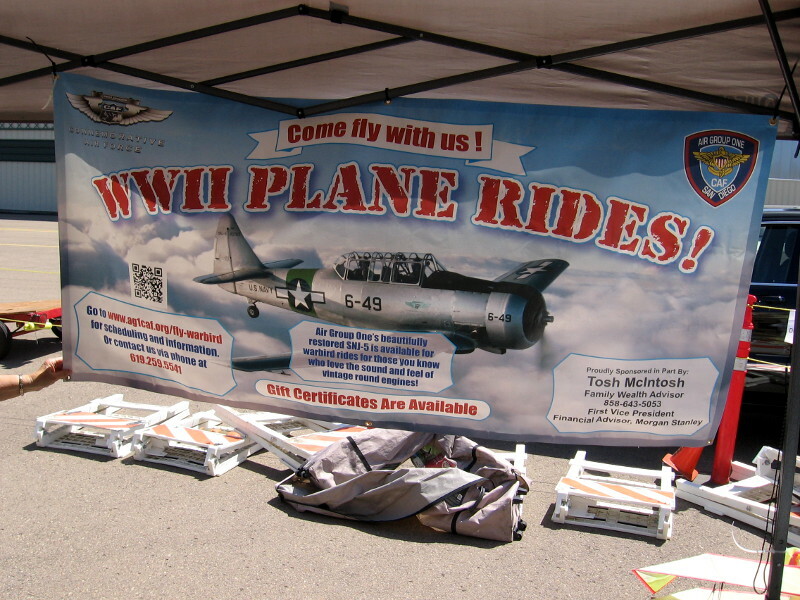 A banner explains that Air Group One’s restored SNJ-5 is available for warbird rides for those who love the sound and feel of vintage round engines. 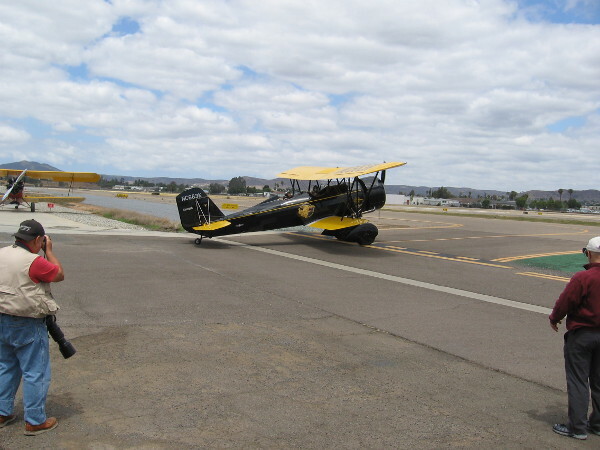 Someone leaves the cockpit of “Sassy” after a ride “around the patch” at Gillespie Field in El Cajon. 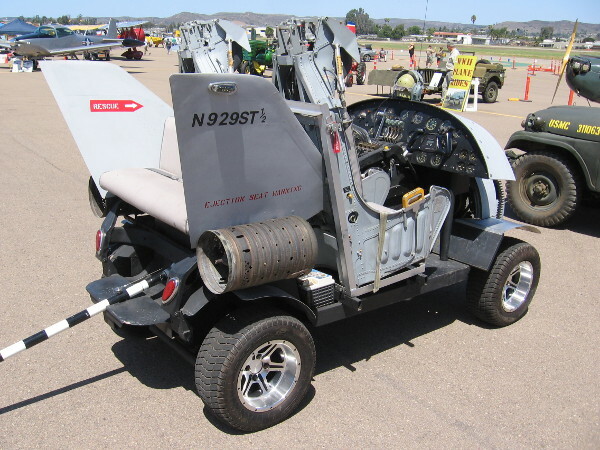 This golf cart was modified to look like a tiny jet airplane! It even has a tailhook! Guys hang out beside a 1943 Ford GPW that was assigned to Captain Victor “Lucky” Moen of the 13th AAF on Guadalcanal, Solomon Islands, during World War II. 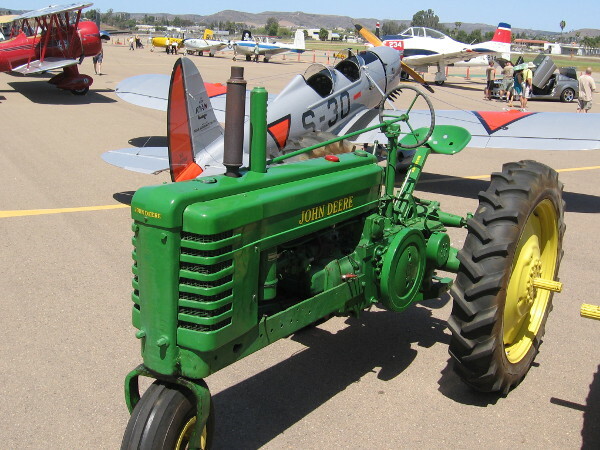 I was surprised to see several old farm tractors out on display among the aircraft! 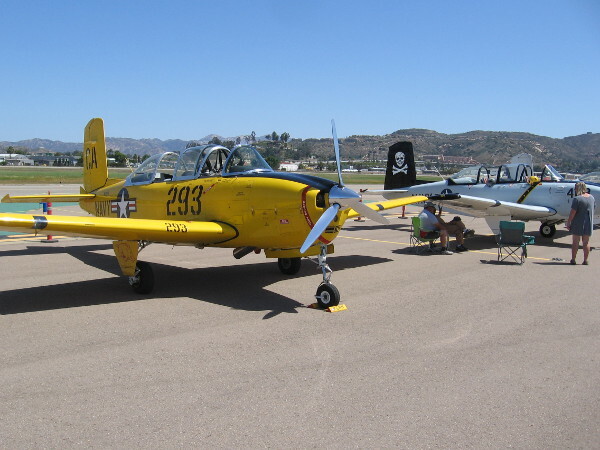 Several restored Beechcraft T-34 Mentor aircraft were out on the Gillespie Field tarmac. 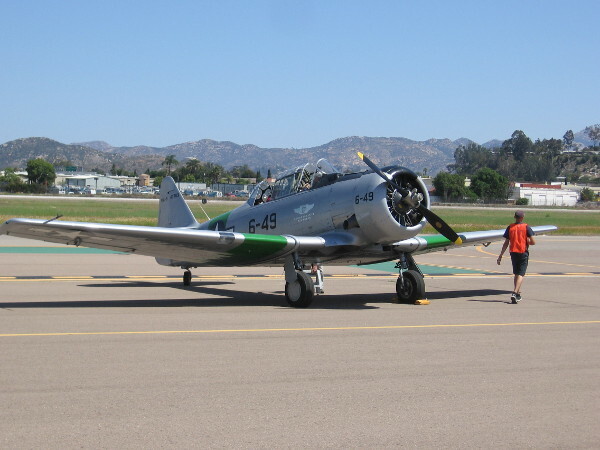 These planes served as versatile military trainers after World War II. This super nice guy was a pilot for the United States Air Force. 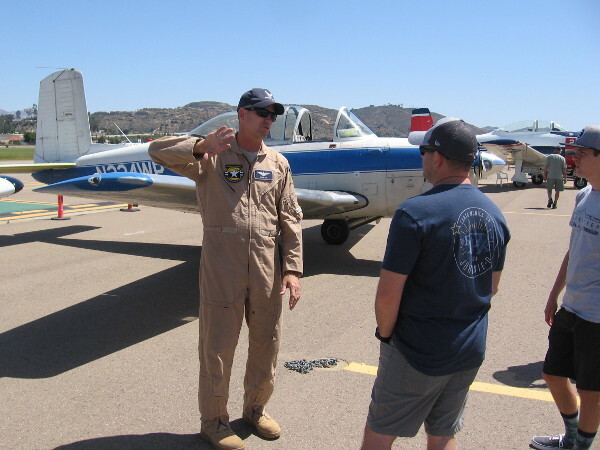 He now flies T-34 aircraft as a member of the March Field Aero Club in Riverside. 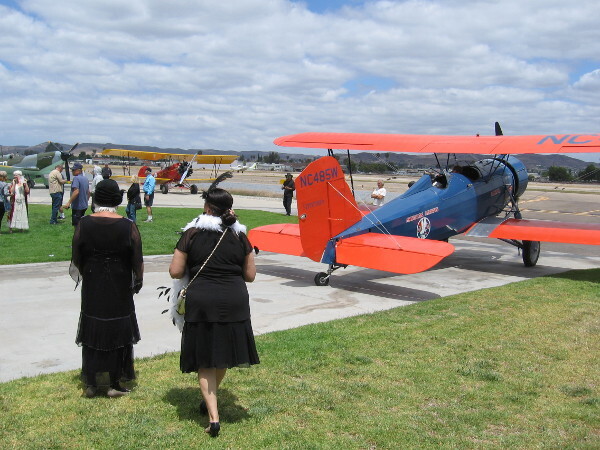 Visitors to Air Group One’s first ever Warbird Expo and Militaria Swap Meet check out more vintage airplanes at Gillespie Field. 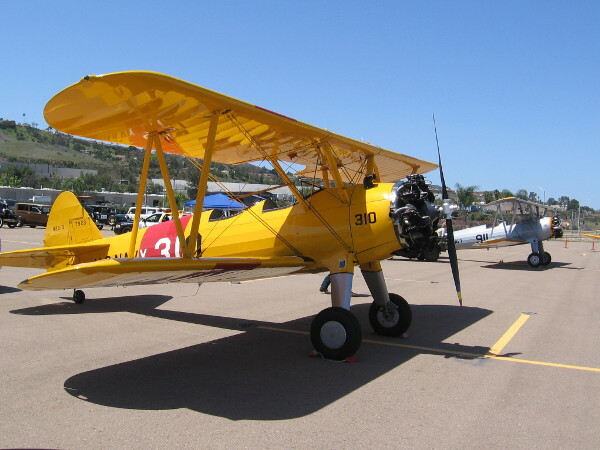 This Stearman (Boeing) Model 75 biplane from the World War II era was painted to honor victims of 9/11. 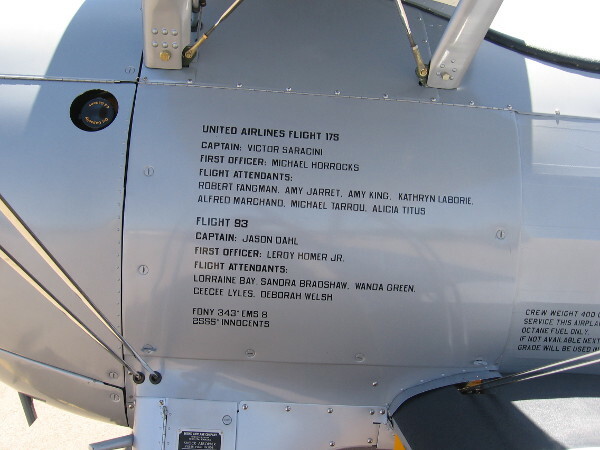 Victims of the September 11 attacks are remembered on either side of the historical airplane. 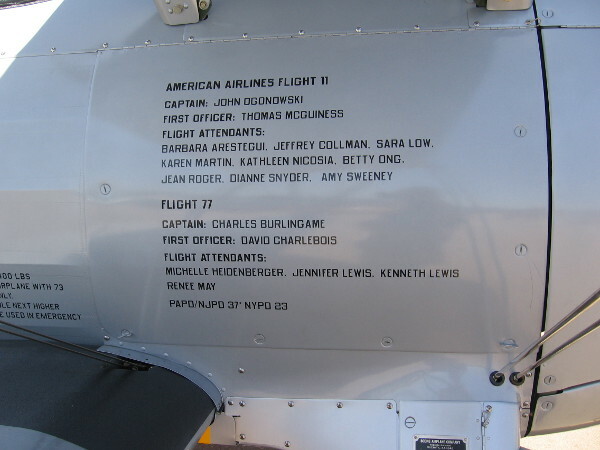 American Airlines Flight 11 and Flight 77. United Airlines Flight 175 and Flight 93. 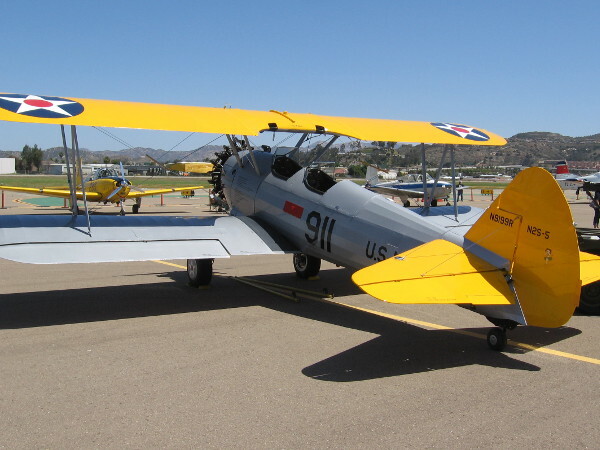 This particular 1945 Stearman PT-17, an Army primary trainer, was the last airplane owned and flown by legendary actor Steve McQueen. 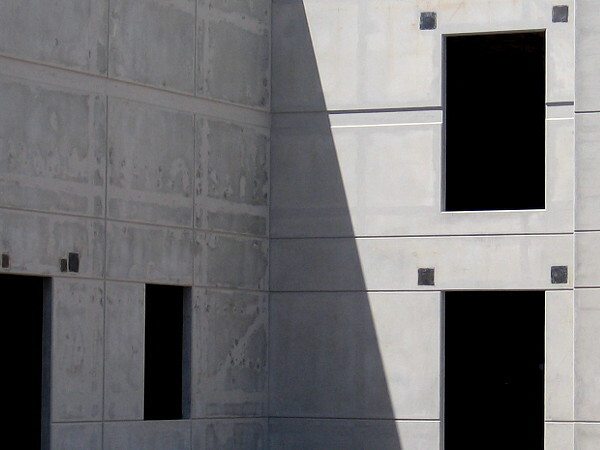 The N number N-3188 was McQueen’s reform school number! 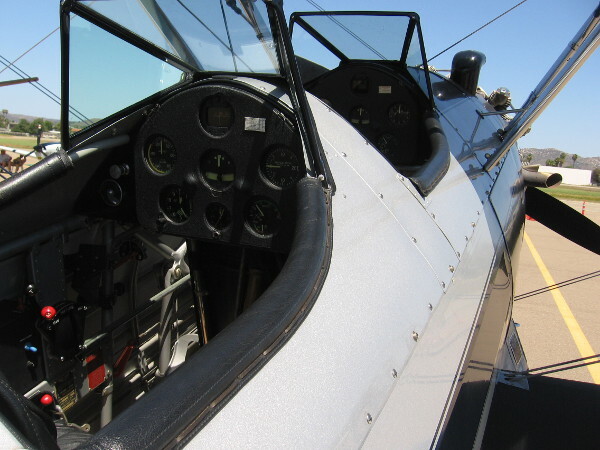 Looking into the rear cockpit of Steve McQueen’s old Stearman PT-17. I saw lots of cool artwork at the Expo. 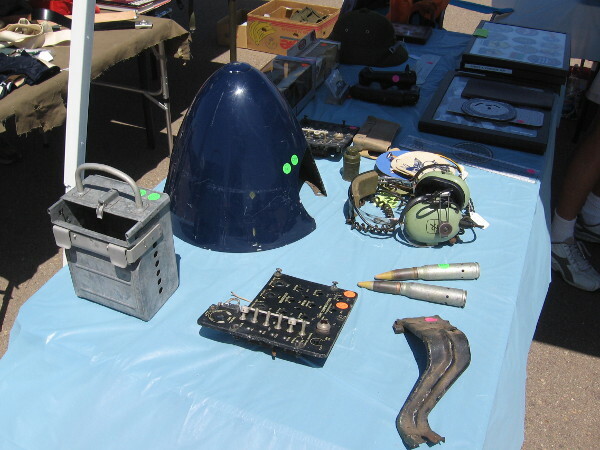 All sorts of miscellaneous aviation antiques, gear and parts were for sale at some swap meet tables. 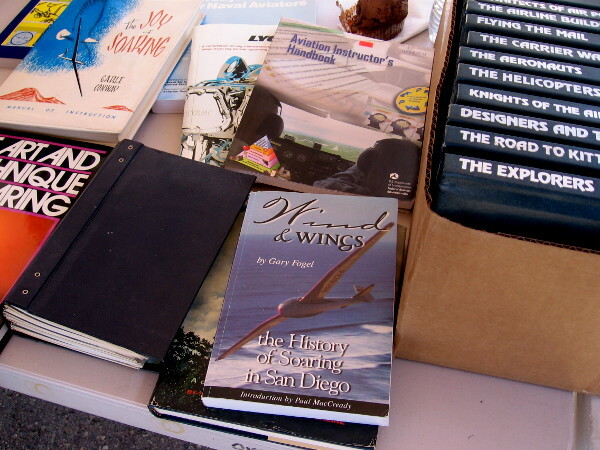 Many books could be found, including one about the history of soaring in San Diego. 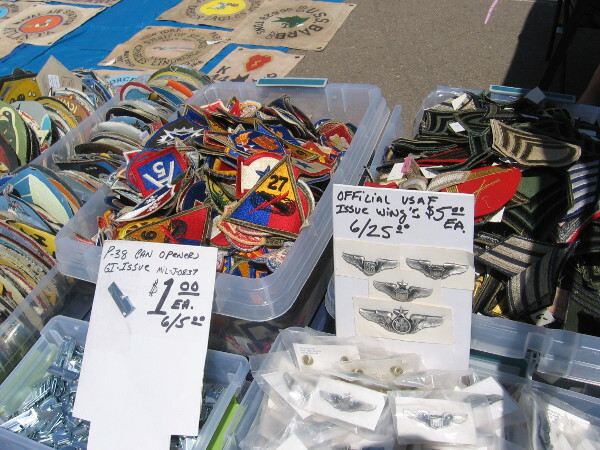 Aviation souvenirs and collectibles for sale at the swap meet included pins and patches. 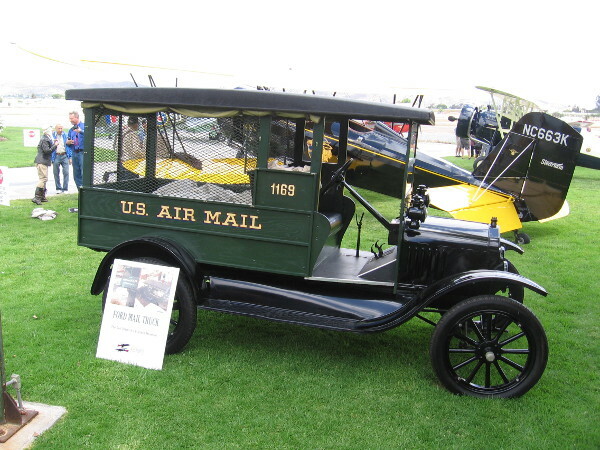 Lots of vintage cars were also on display. 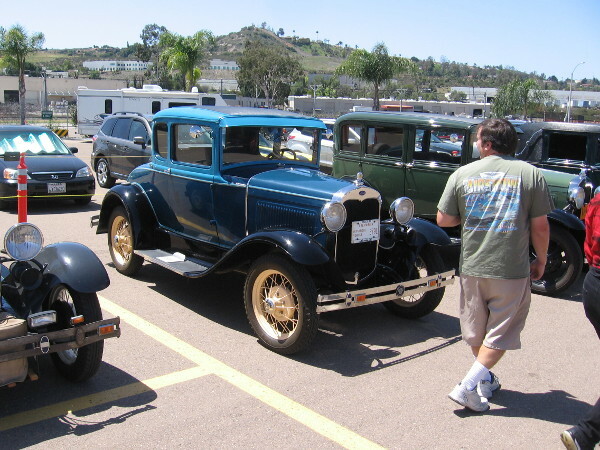 The San Diego Model A Club was well represented. 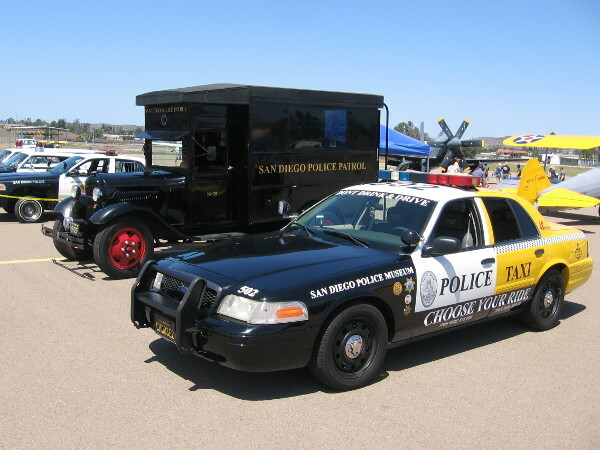 Other vehicles at the event included an old San Diego Police paddy wagon and an eye-catching San Diego Police Museum patrol car/taxi combo that discourages drinking and driving. 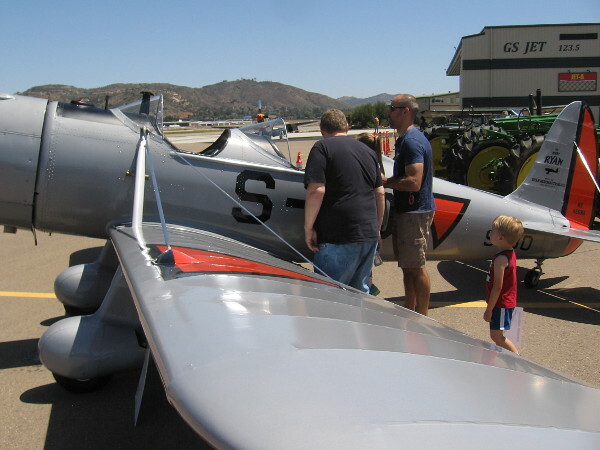 Checking out a Ryan STM-2 manufactured in San Diego in 1940. 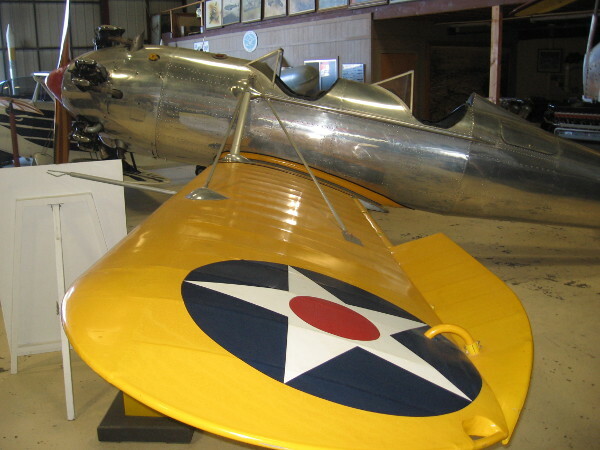 It now belongs to the Allen Airways Flying Museum at Gillespie Field. 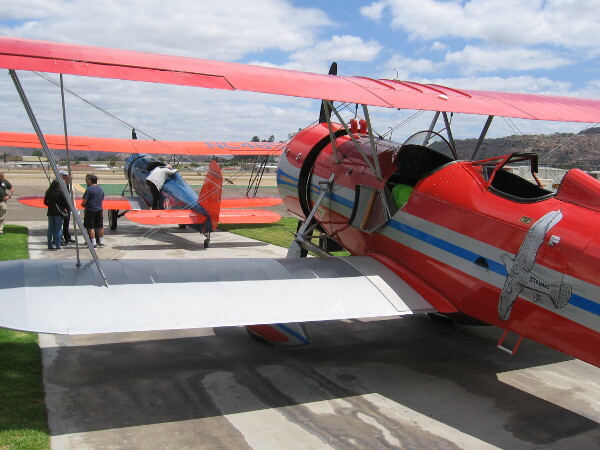 Posted on April 15, 2018 April 15, 2018 Tags 911, airplanes, aviation, cool, el cajon, events, history, military, photography, police, san diego, tractors, vintage cars, world war II2 Comments on Photos of cool aviation event at Gillespie Field! 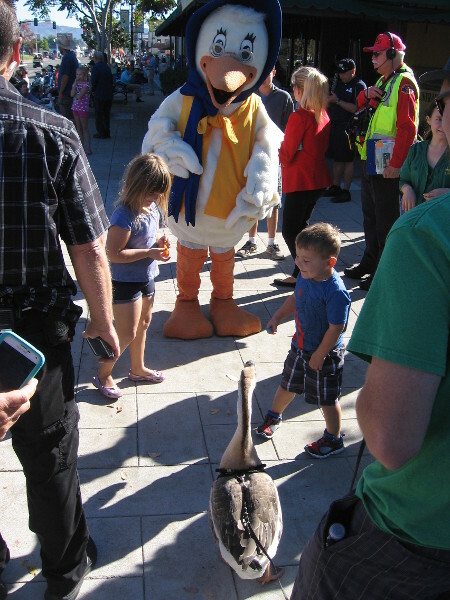 Fun photos of the Mother Goose Parade! 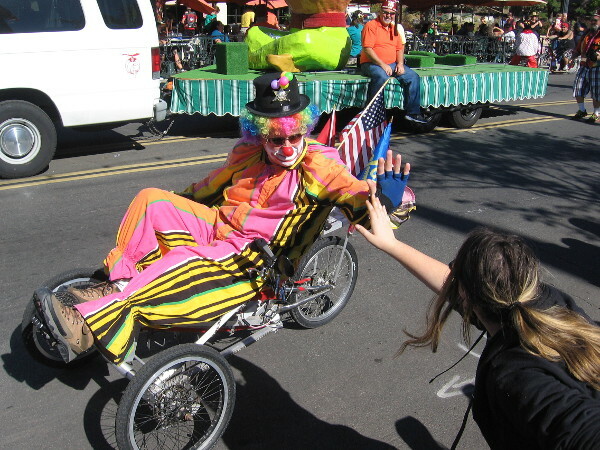 Shriner clown gives high fives to crowd during the 2015 Mother Goose Parade in El Cajon, California. 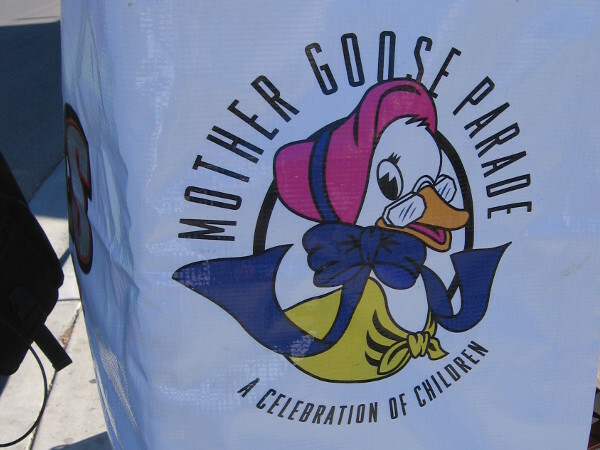 The 69th Annual Mother Goose Parade was held today in El Cajon, out in San Diego’s East County. 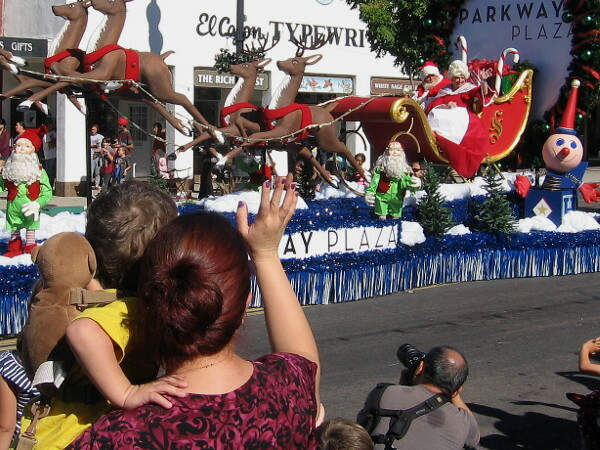 The popular parade, which originated in 1947, is a highly-anticipated local tradition that marks the beginning of the holiday season. This year the theme was super heroes, both fictional and real. 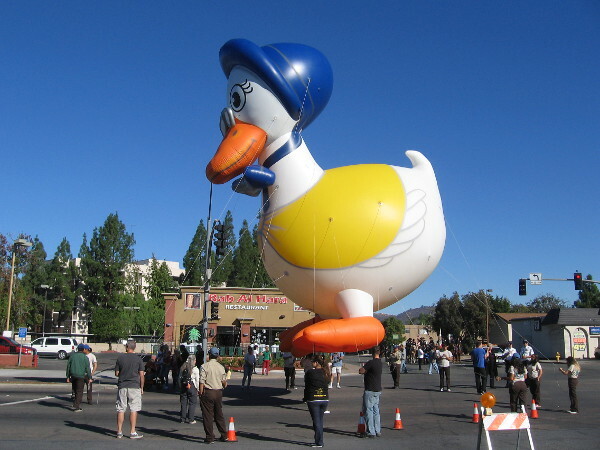 Mother Goose Parade, A Celebration of Children, is the second largest parade west of the Mississippi. 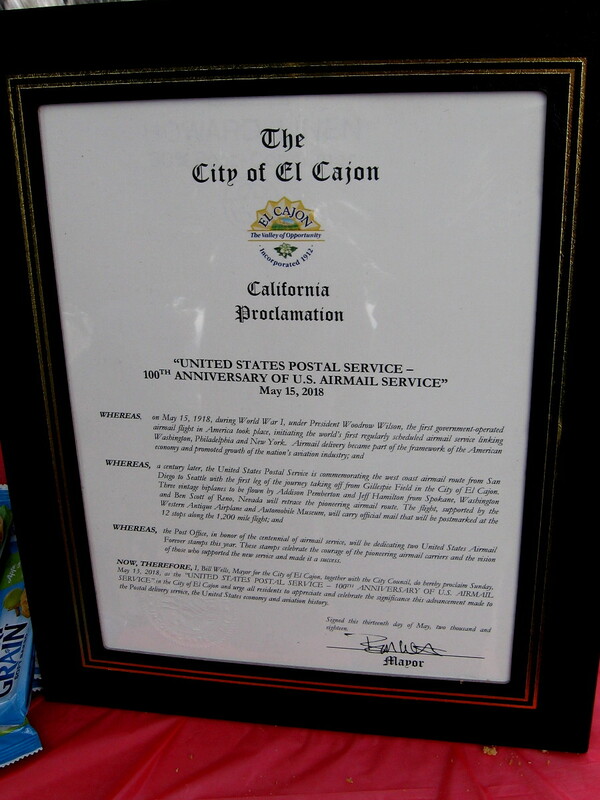 It’s celebrating its 69th anniversary this year! 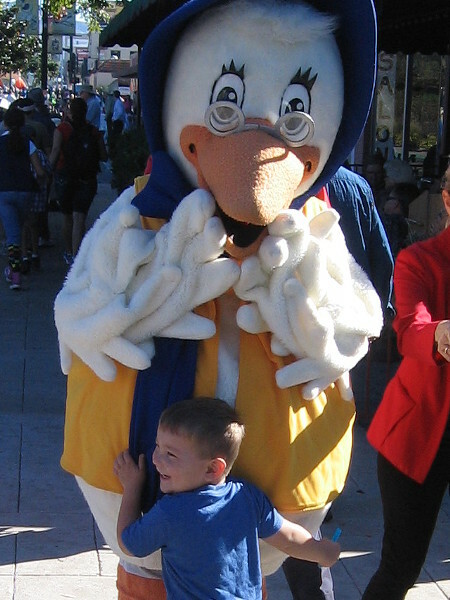 A young boy hugs Mother Goose before the parade begins. And here comes a live goose! 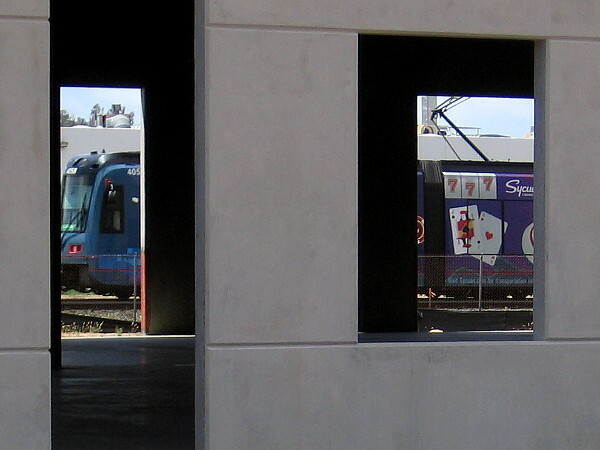 It was honking in a friendly way, much to the delight of everybody. 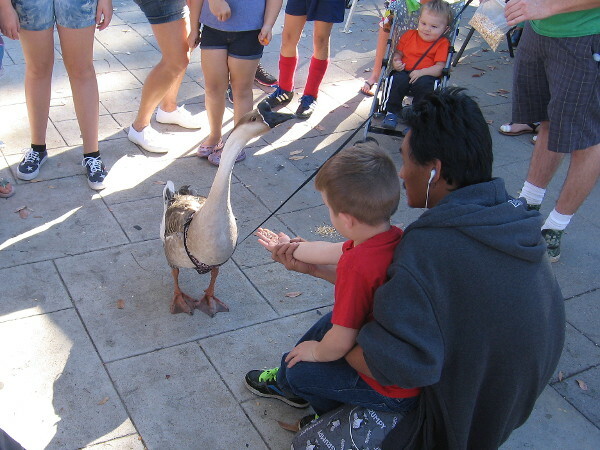 Kids gravitated toward the goose. It gravitated toward some offered food. 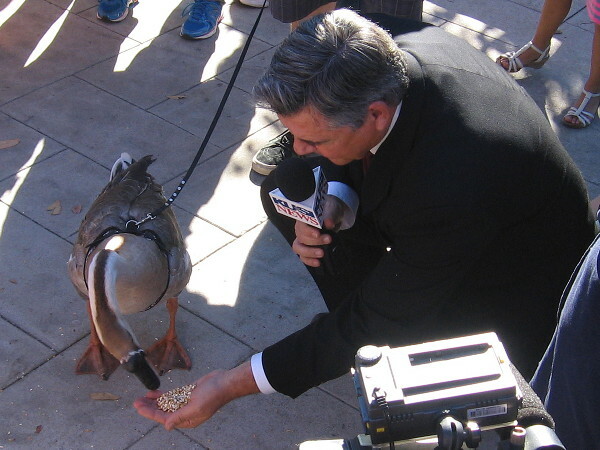 Dave Scott from KUSI News was introducing television viewers to Mother Goose and “Other Goose”! It was the funniest thing I saw all day! 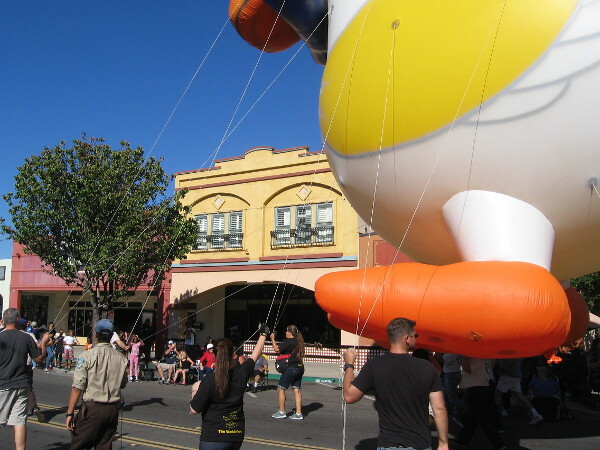 An inflatable Mother Goose balloon floats in the blue sky as the parade is ready to begin. The Mother Goose Parade is underway! 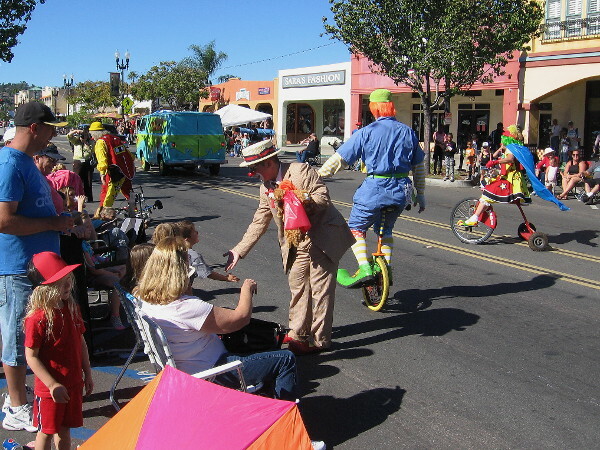 The fun annual tradition in San Diego’s East County draws enormous crowds. 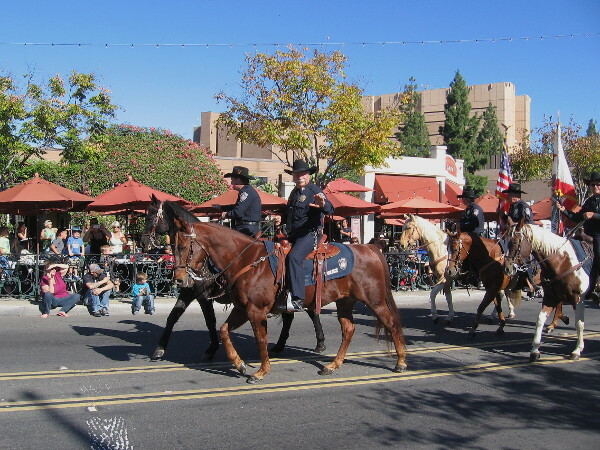 These friendly guys on horseback are from the El Cajon Mounted Police. 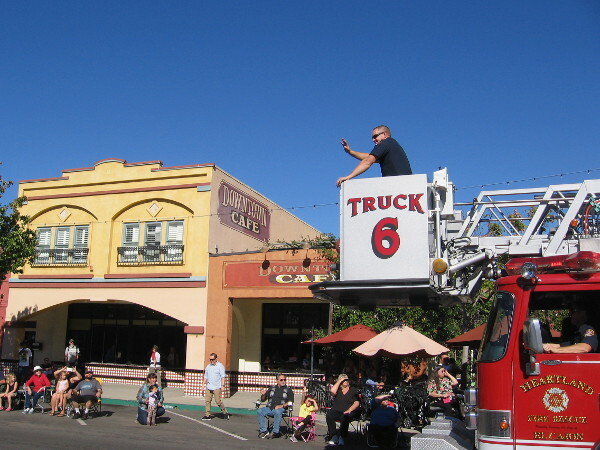 Truck 6 of Heartland Fire and Rescue sounds its loud horn and siren as it passes by! 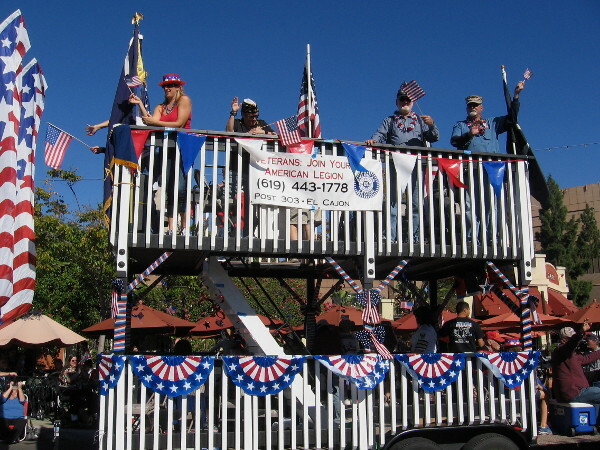 A big, patriotic American Legion float in the Mother Goose Parade. 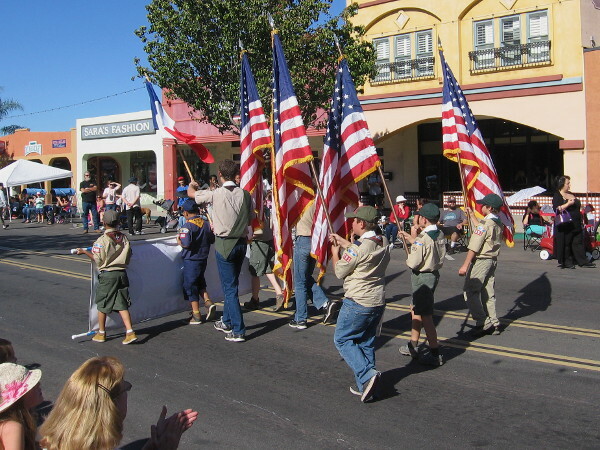 The Boy Scouts parade the colors down Main Street in El Cajon. 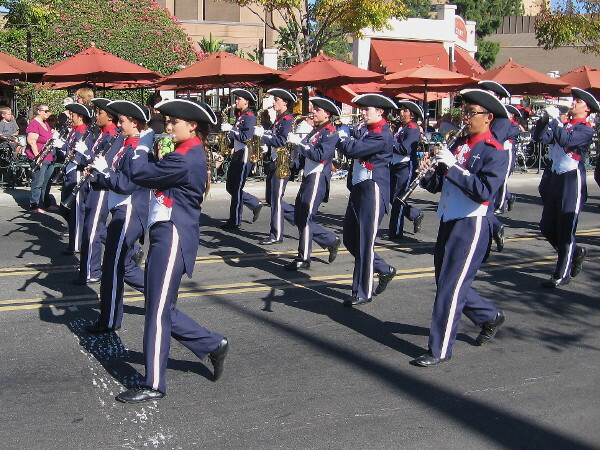 The marching band of Christian High School in El Cajon provides stirring music during the parade. 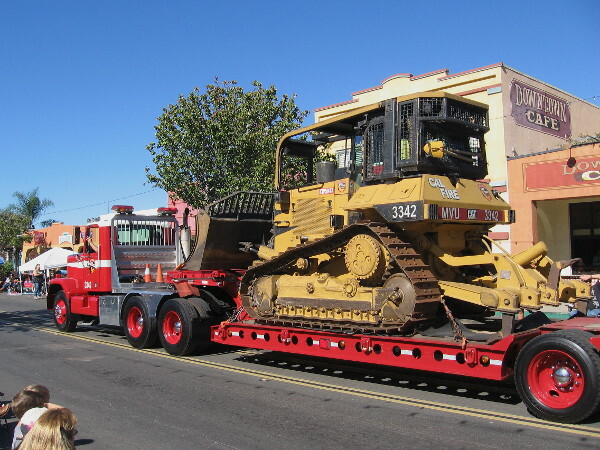 Cal Fire had a huge bulldozer in the parade! 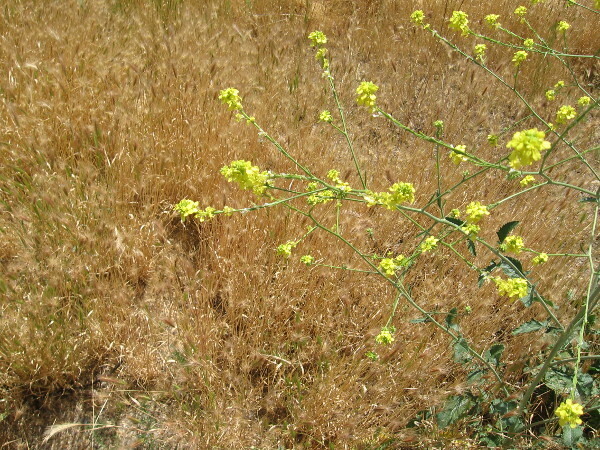 Wildfire poses a big threat to San Diego’s East County neighborhoods. Families have gathered on a beautiful Saturday morning. 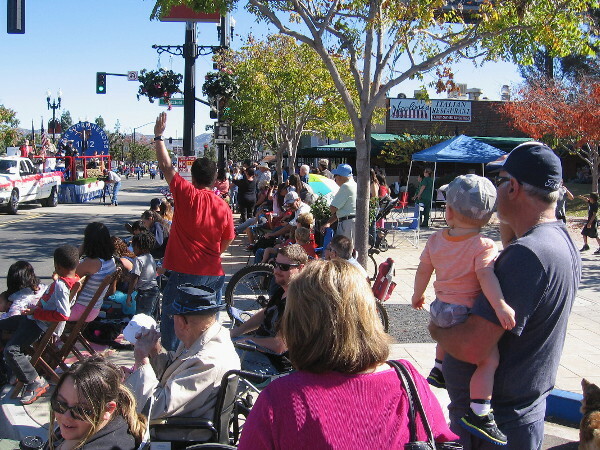 Kids and adults watch the Mother Goose Parade, which this year has a super hero theme. 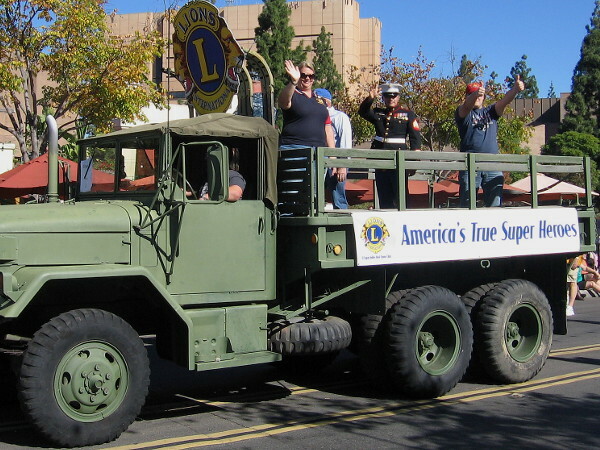 The Lions Club showcased America’s true super heroes–those who serve to defend our freedom. 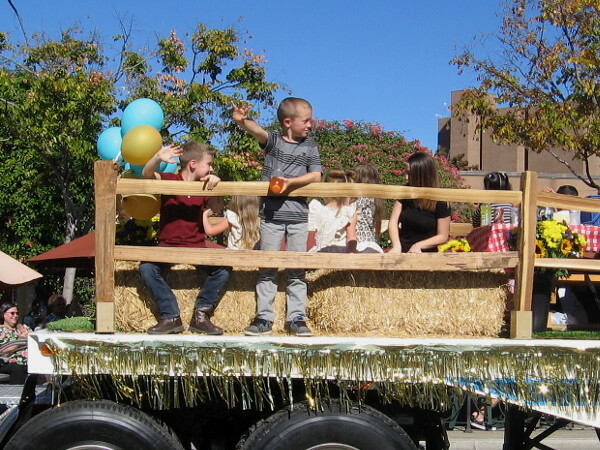 Kids wave from a float dedicated to raising awareness about childhood cancer. A bunch of wacky clowns following the Scooby Doo Mystery Machine made lots of people smile. 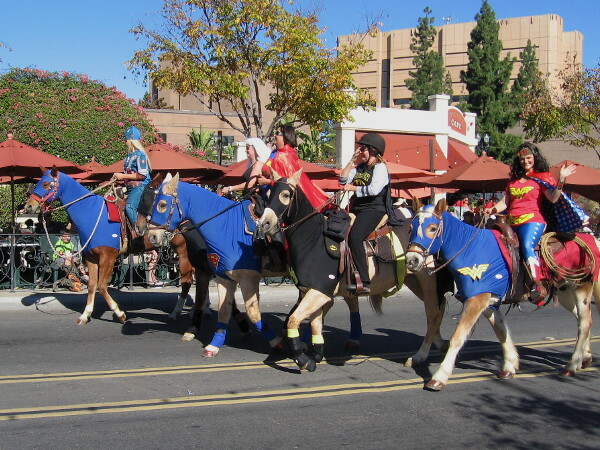 This equestrian group had superhero horses! Now I’ve seen everything! And at the end of the parade, as always, there was Santa Claus. The jolly old elf and Mrs. Claus seem to be enjoying the sunny Southern California day. Ho, ho, ho! Merry Christmas! 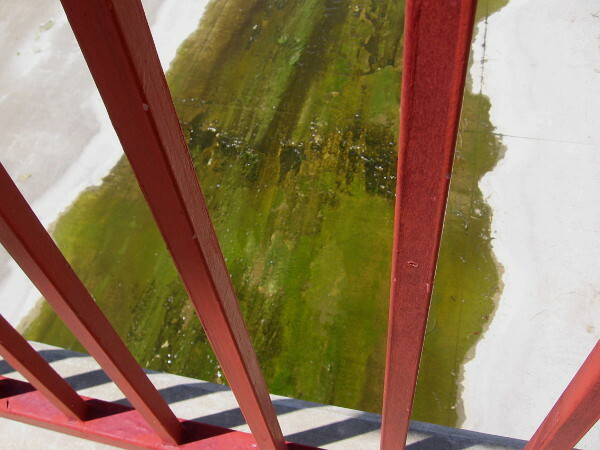 Join me for more fun sights on Facebook and Twitter! 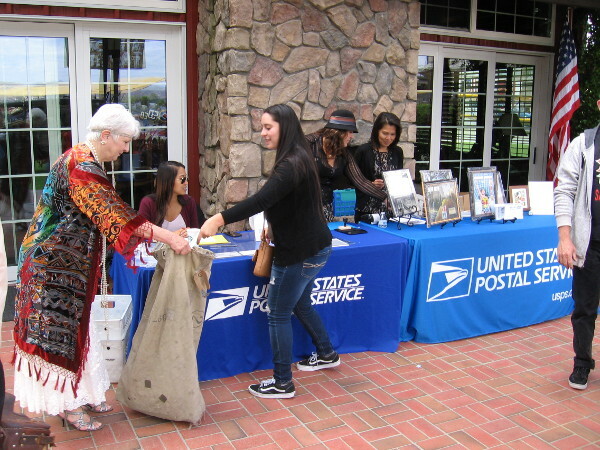 Posted on November 21, 2015 November 22, 2015 Tags children, el cajon, events, family, fun, happy, heroes, holidays, kids, parades, patriotism, superhero2 Comments on Fun photos of the Mother Goose Parade!